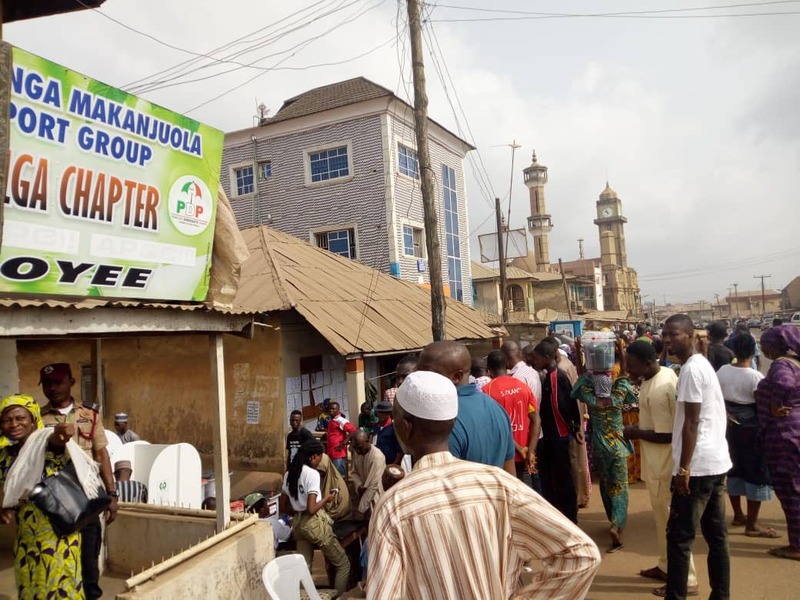 Video: OPC Boys threatening voters to vote for APC or go home. 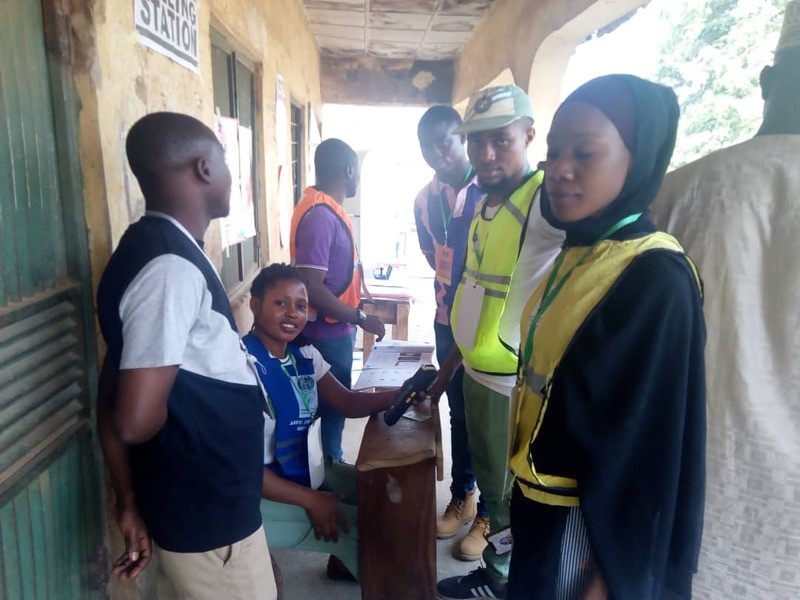 10.40am: At the poling Unit Code 073 Abule-Okuta/Ilaje/Bariga Lagos State – Policemen are seen relaxed, not bothered about security or protecting poling Unit. 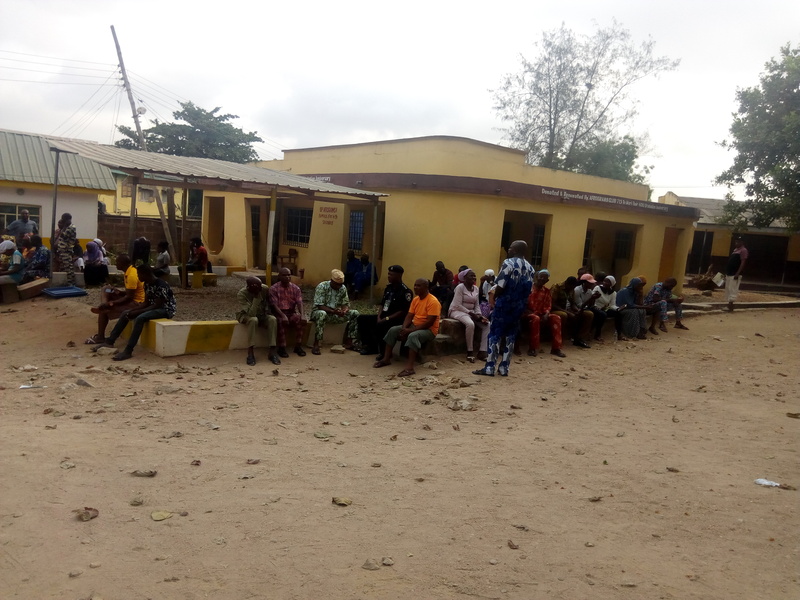 10:15: PU 06, Oro, Irepodun LGA, Kwara South. 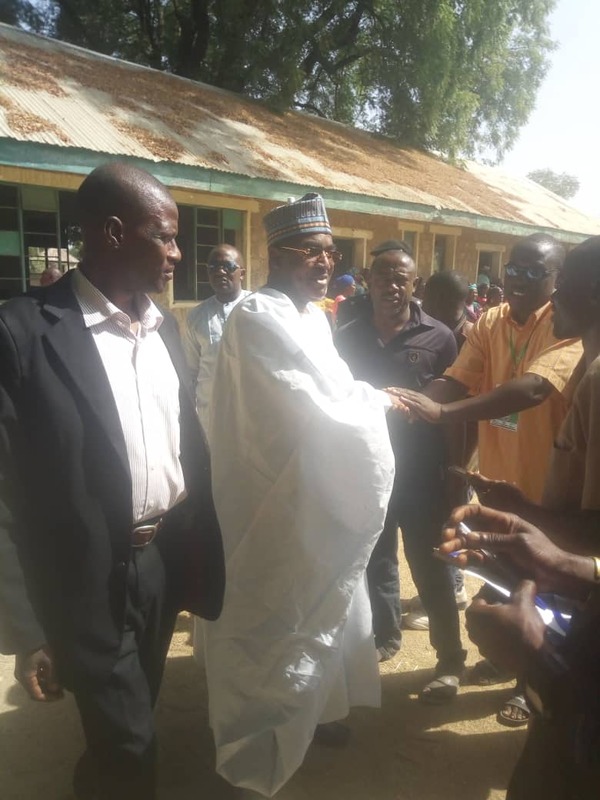 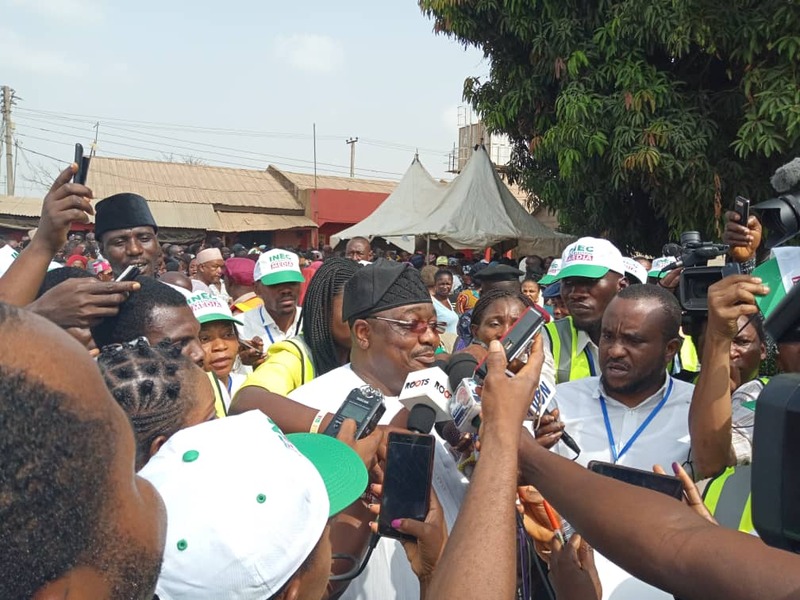 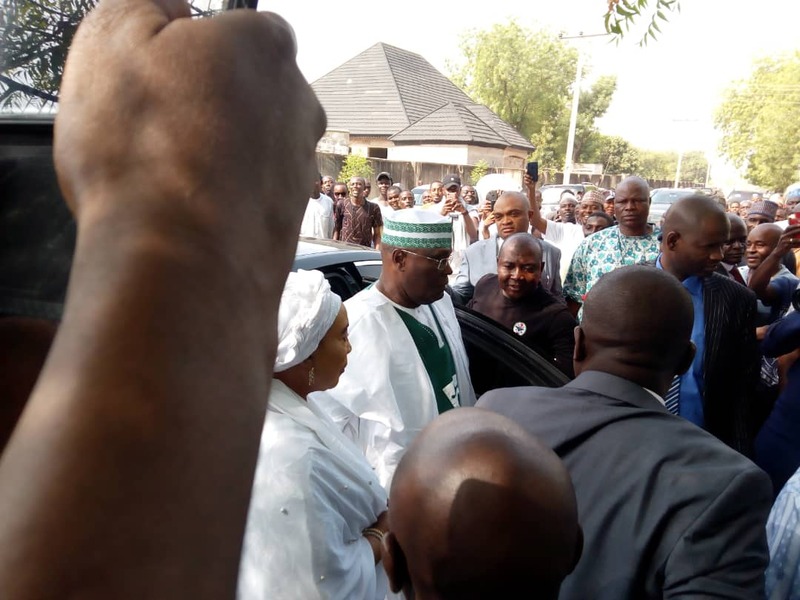 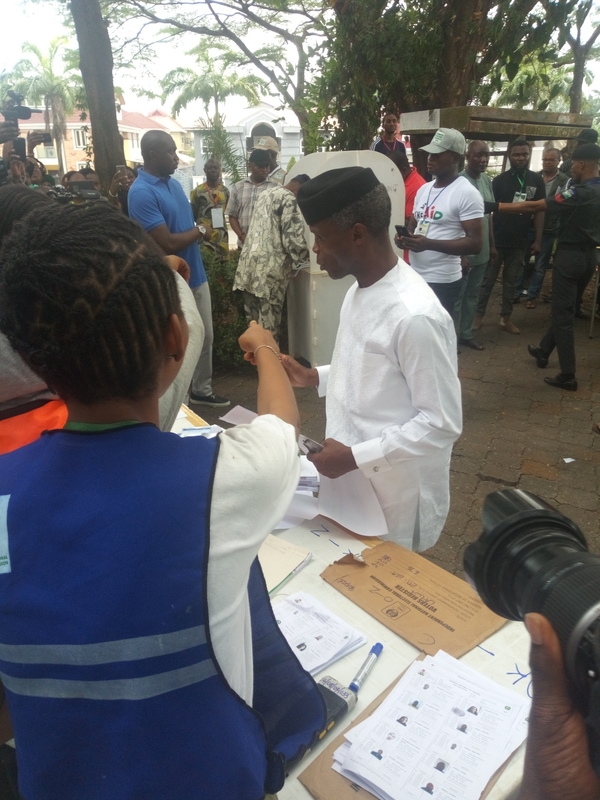 Information minister Lai Mohammed arrived to vote. 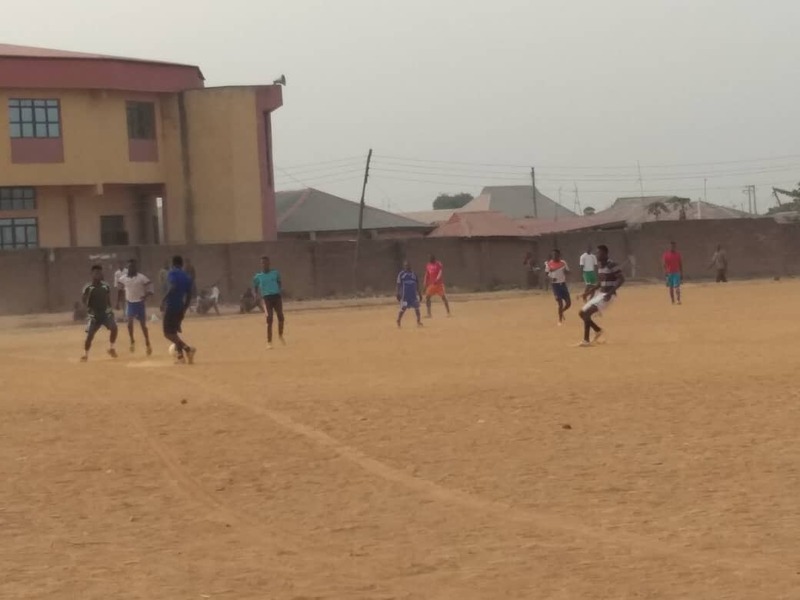 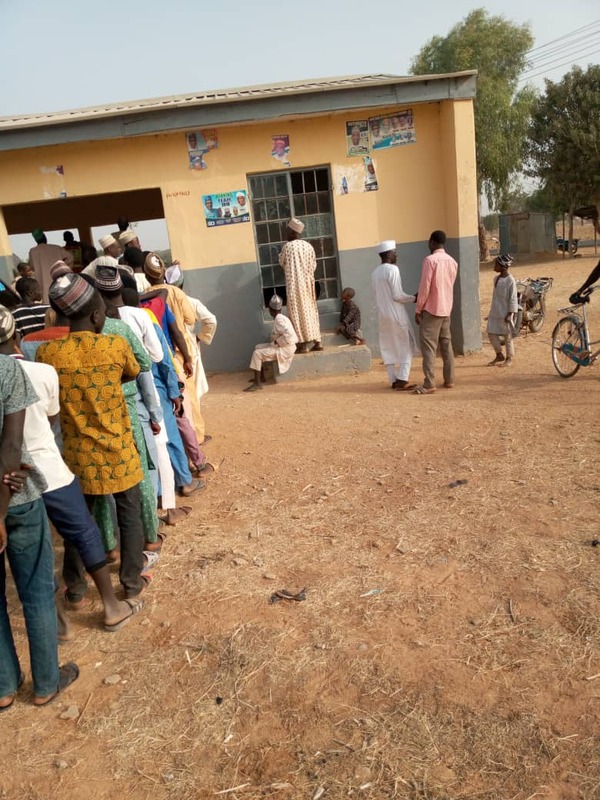 Senatorial District Kano North, LGA Rimi Gado, Ward Ugunwar Ganji Open space. 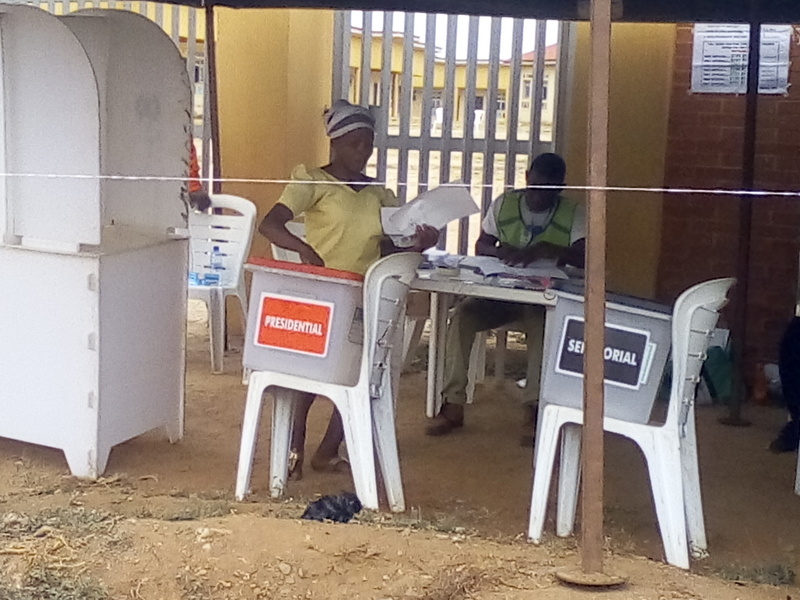 @9:50am Ward 01 PU 011 Shomolu Local Government Lagos East Senatorial District. 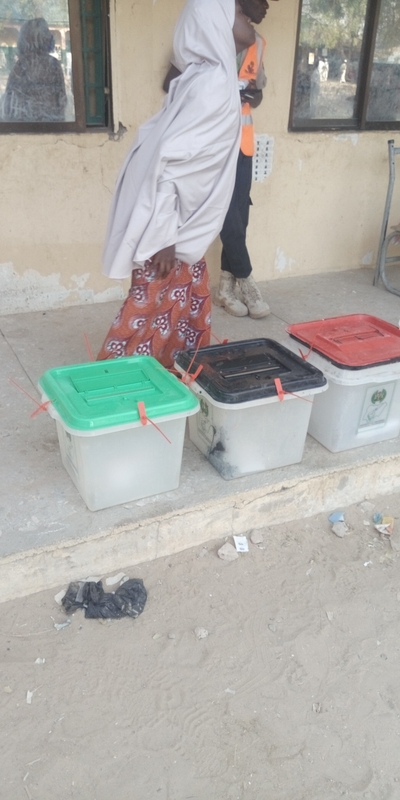 Voting has not commenced as PO Still addressing Party Agents. 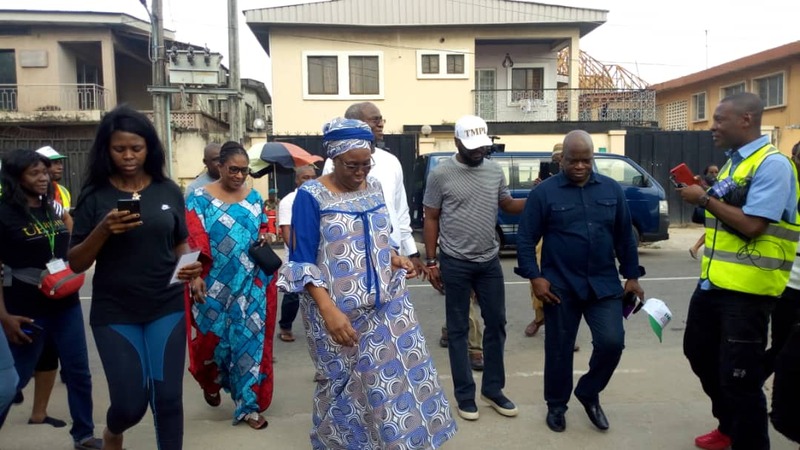 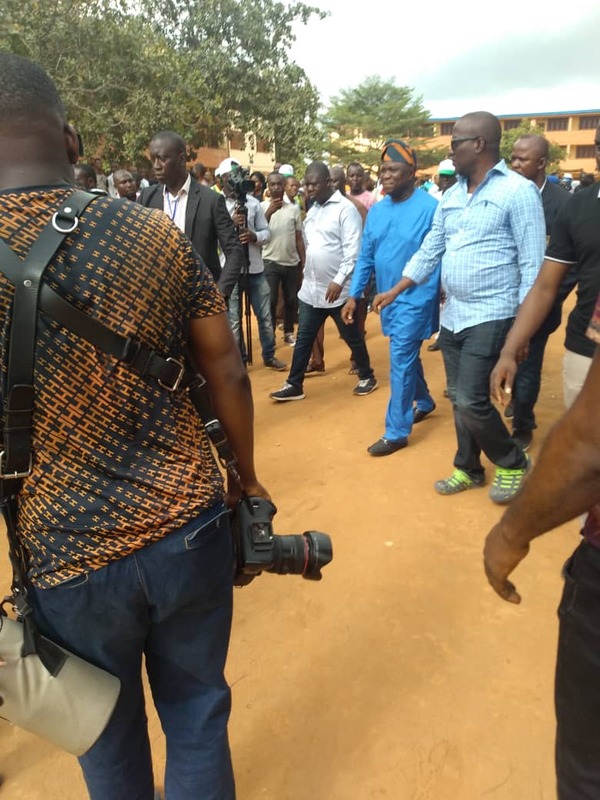 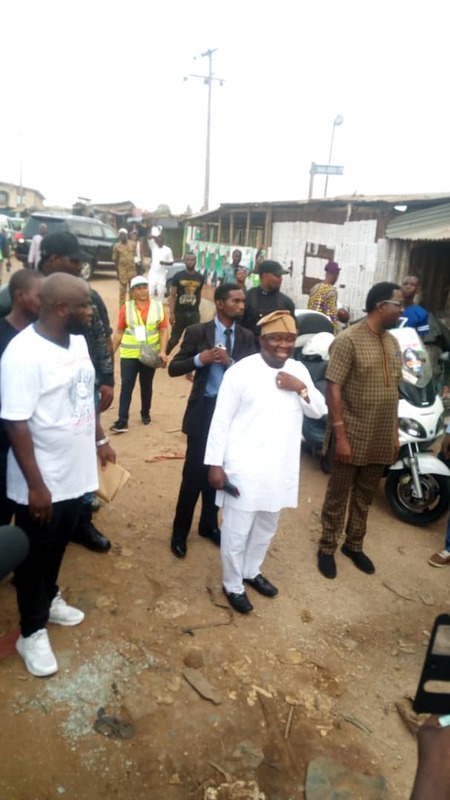 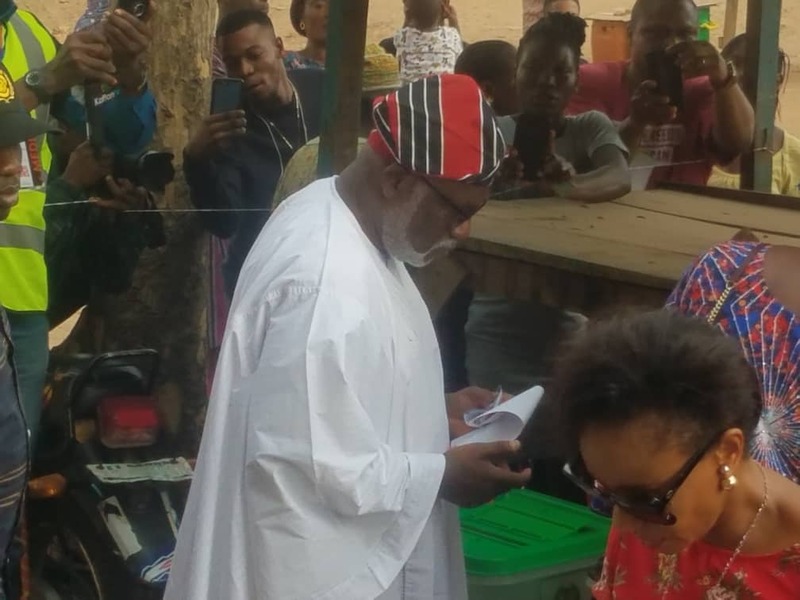 Time : 09:40am Ward: Ijebu 2 ward 005 Polling unit : 006A LGA: OWO Senatorial district : Ondo North Info: The governor of Ondo state Rotimi Akeredolu Aketi is here currently exercising his right to vote at owo. 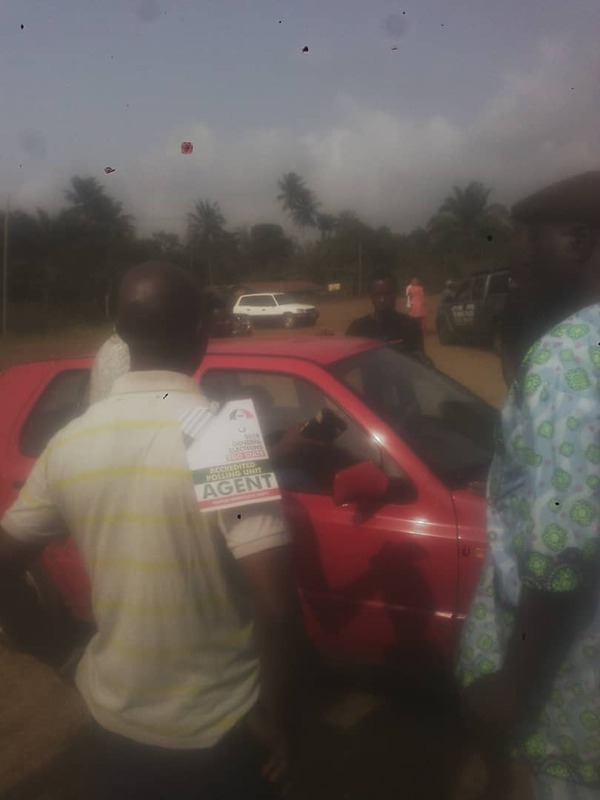 He came in with a convoy of 4hilux,2 jeeps and his personal car. 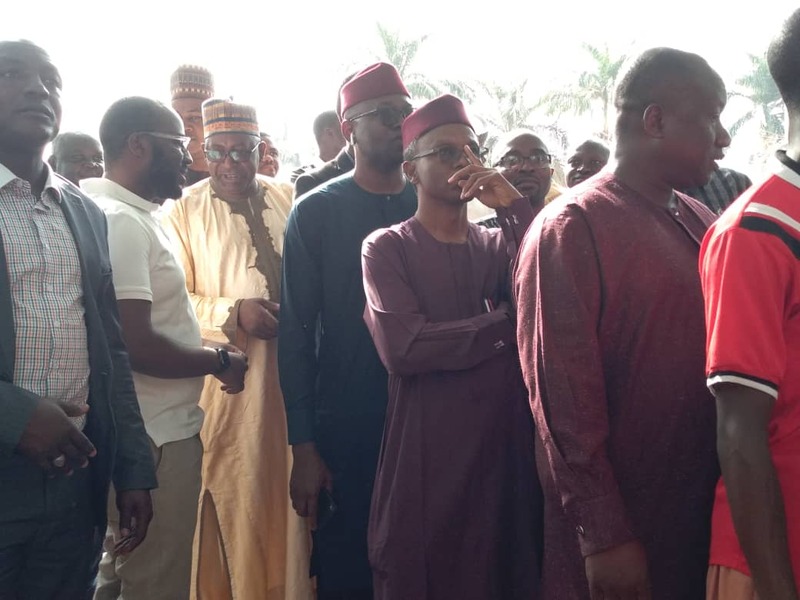 He actually jumped the queue with his wife. 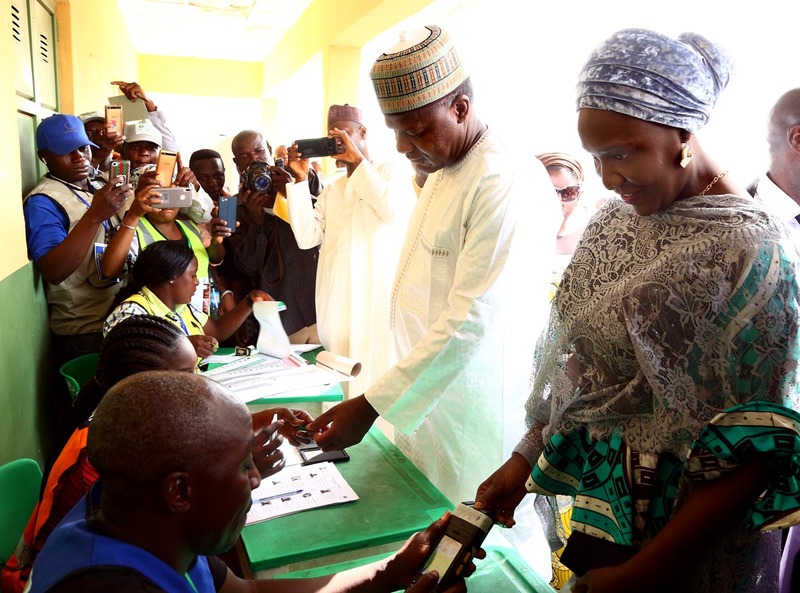 The card reader read their card and scanned the thumbprint successfully. 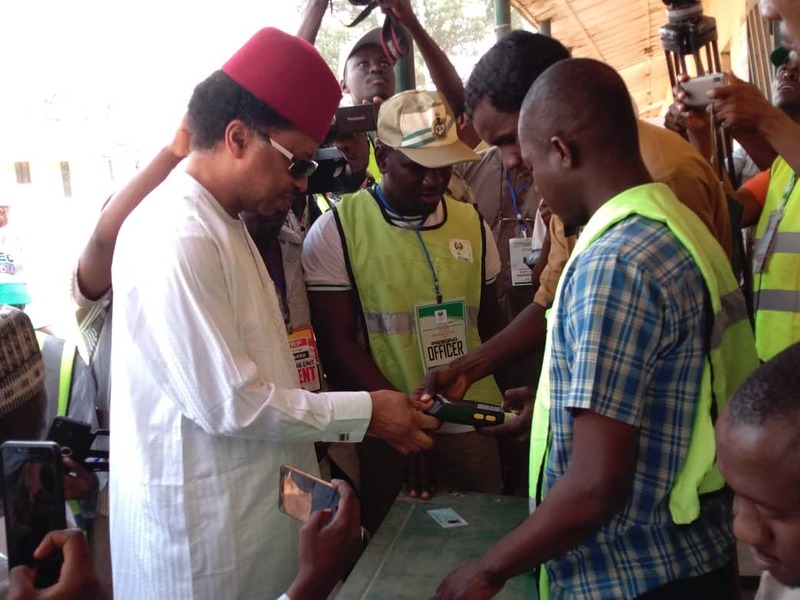 He talked about the readiness of the inec officials and the prompt delivery of materials at his polling unit. 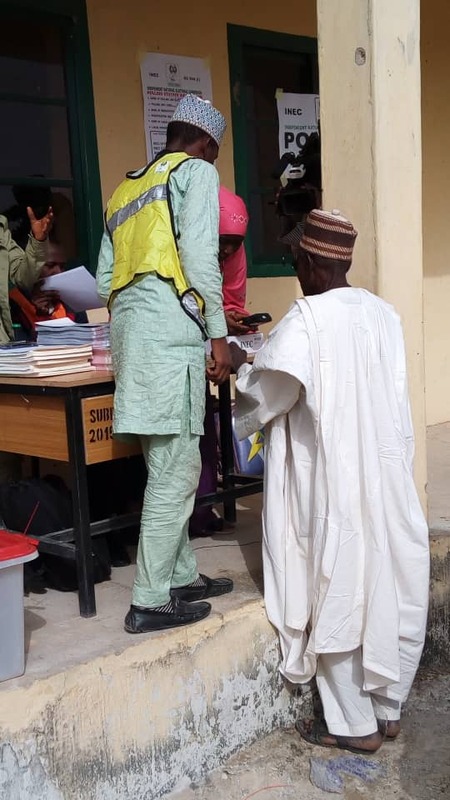 He came into the polling booth peaceful without a security by his side. 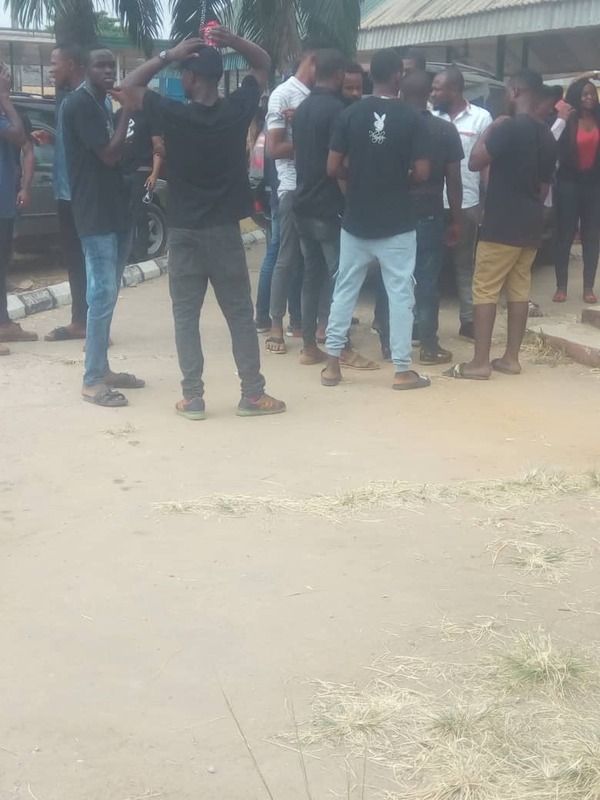 Dickson-NAIJA CENTER: A group of boys are seen arguing about money. 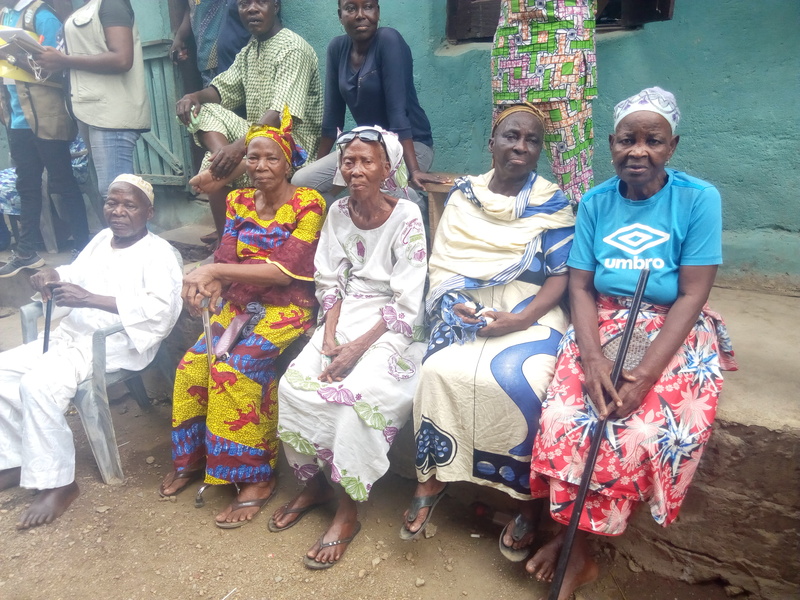 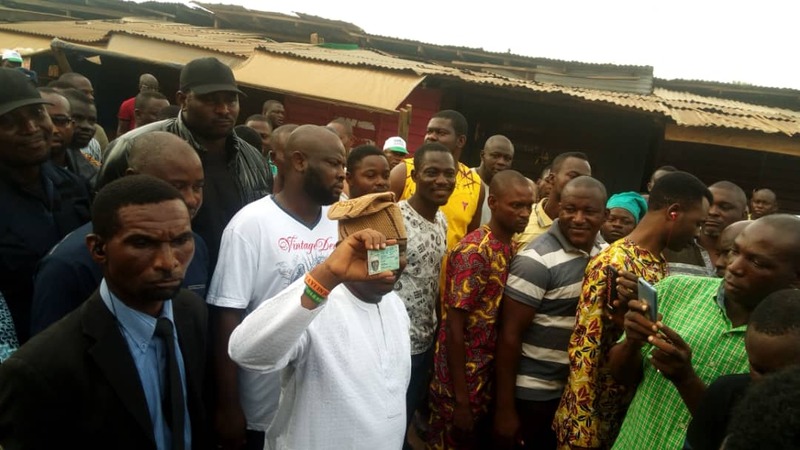 The sharing formula is not agreed by the boys who seem to be speaking in a strange language at Unit 073 Abule-Okuta/Ilaje/Bariga Lagos State. 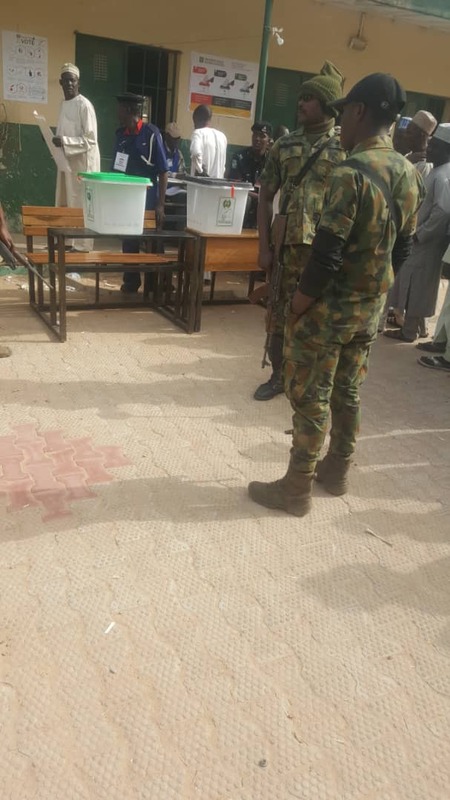 Security here is fair…some Soldiers are moving about…not steady at a point…two police officers are visibly attached to this polling unit. 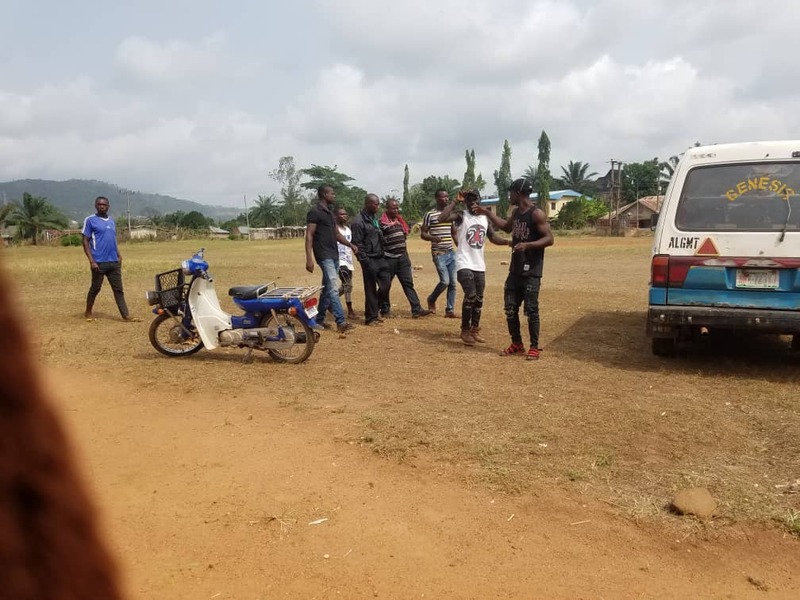 The spokesman said the team gave the vehicle a hot chase, the two (2) occupants abruptly stopped and escaped into a nearby bush. 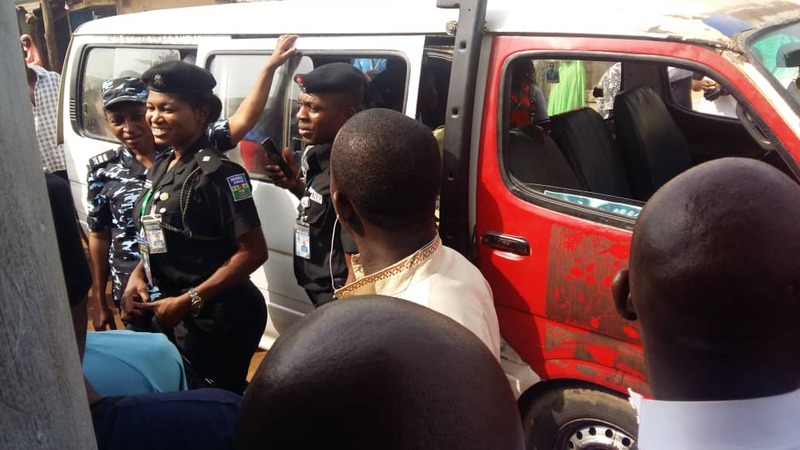 He however noted that upon thorough search of the vehicle, “128 pieces of 60mm.156 kg emulsion chemical substances and 5 pieces of electric detonators all concealed in several black bagco bags along with Hilux van were recovered”. 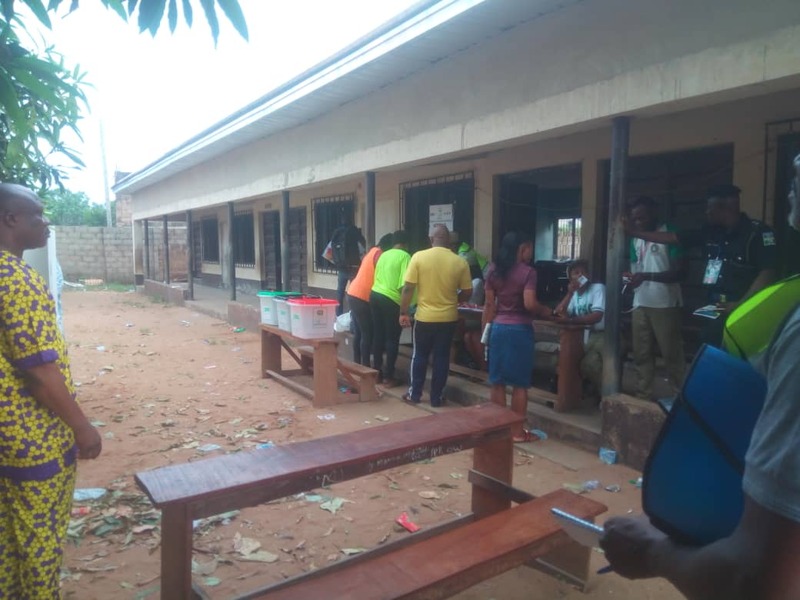 9:37am Ezema ward, 002, IGBO Eze South LG, Enugu North, Name checks have commenced, and the environment is normal. 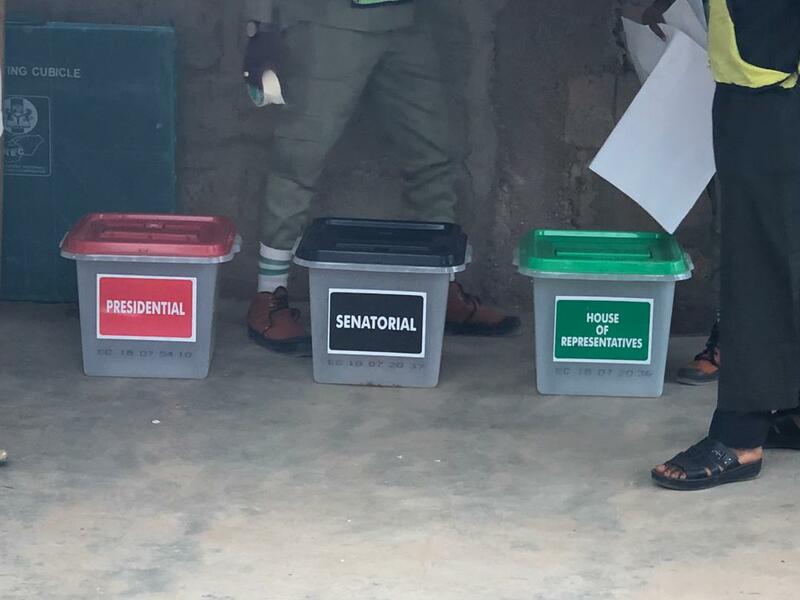 The election process just started here. 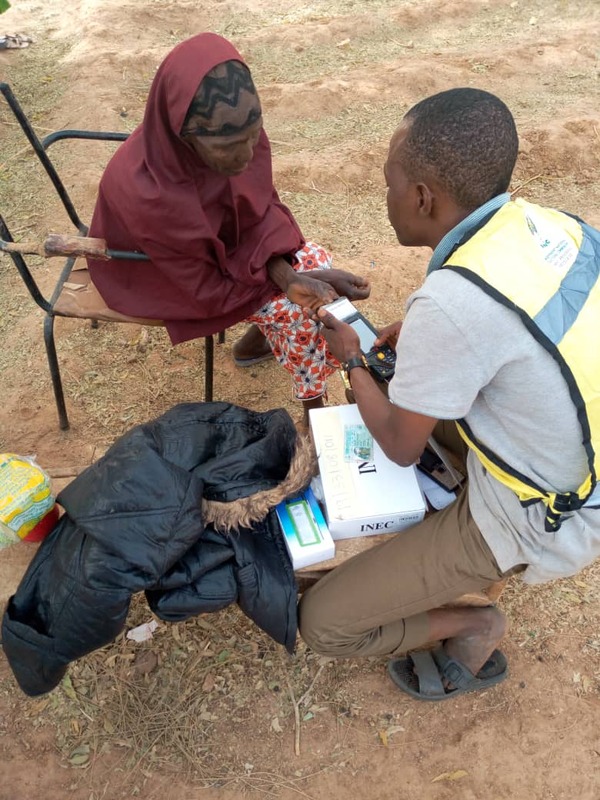 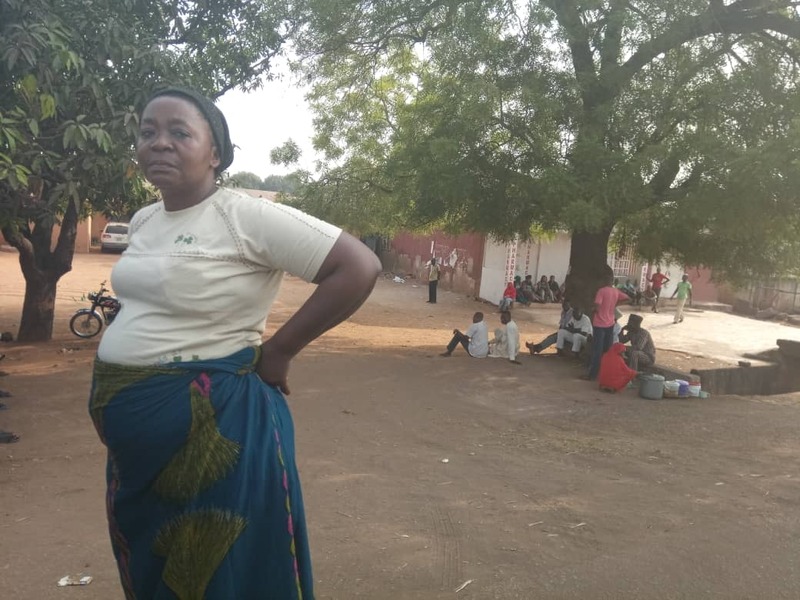 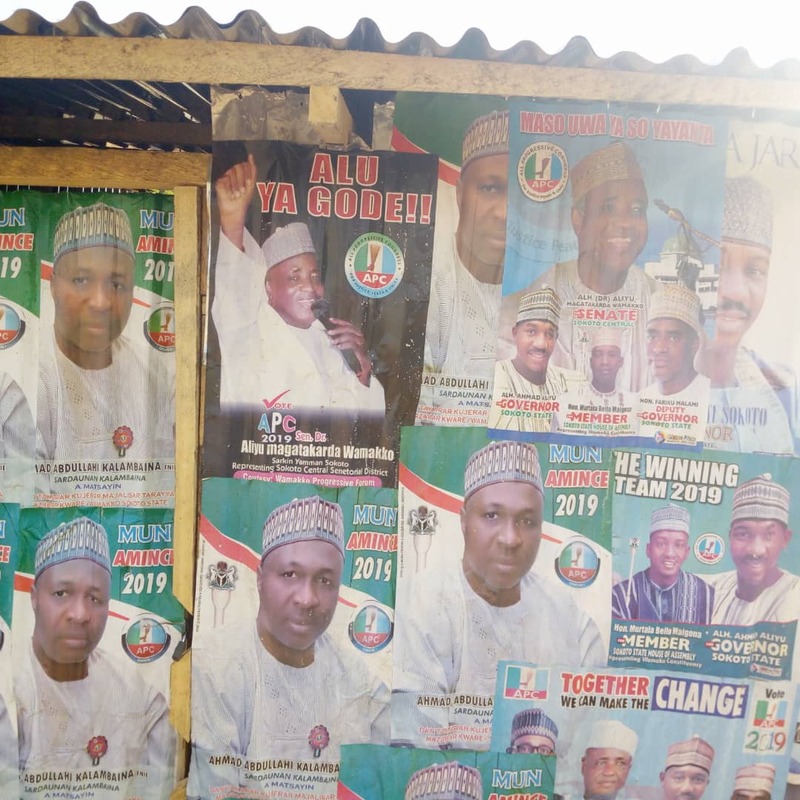 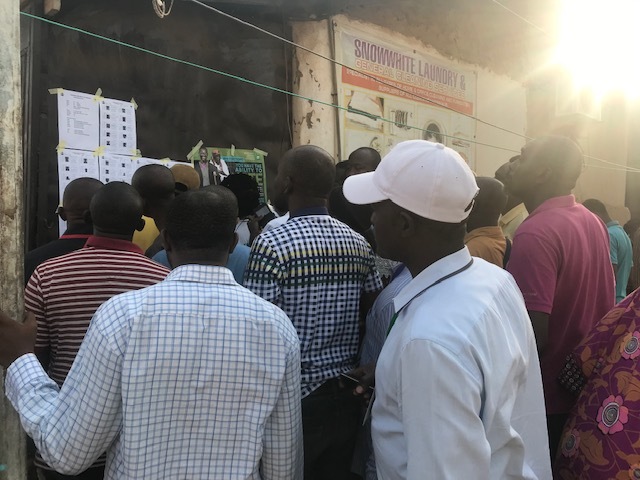 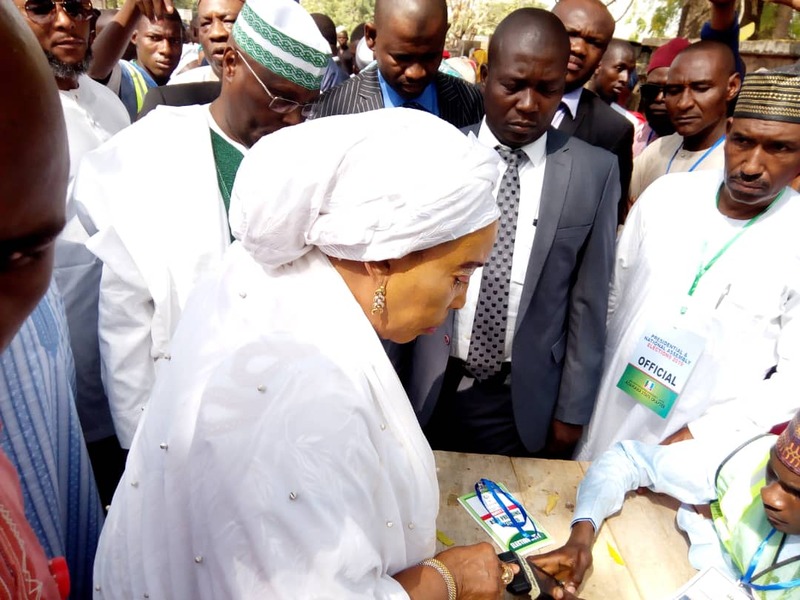 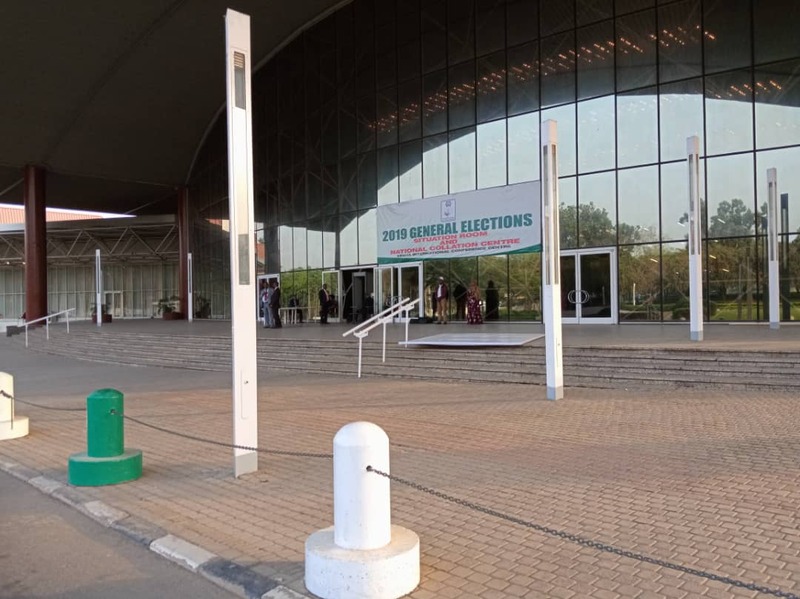 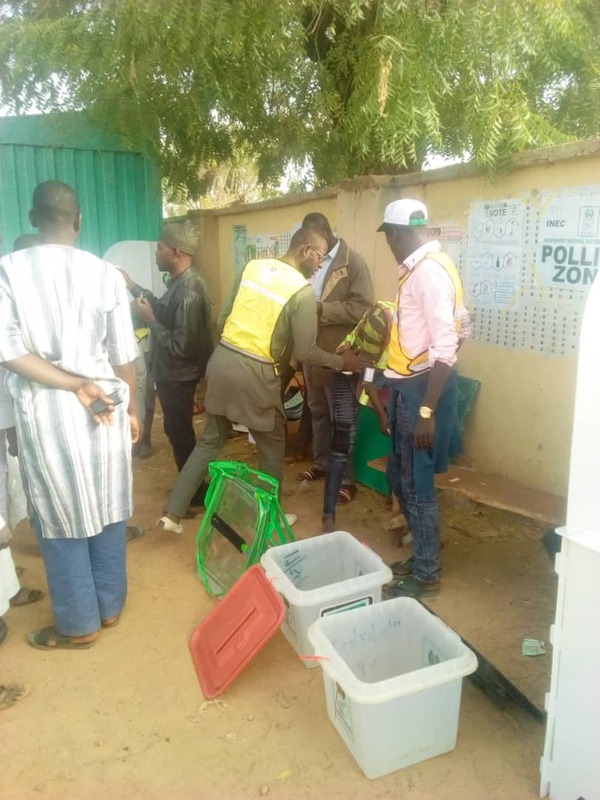 INEC officials expected to conduct the Presidential and National Assembly election are yet to arrive at many polling units in Plateau State.. 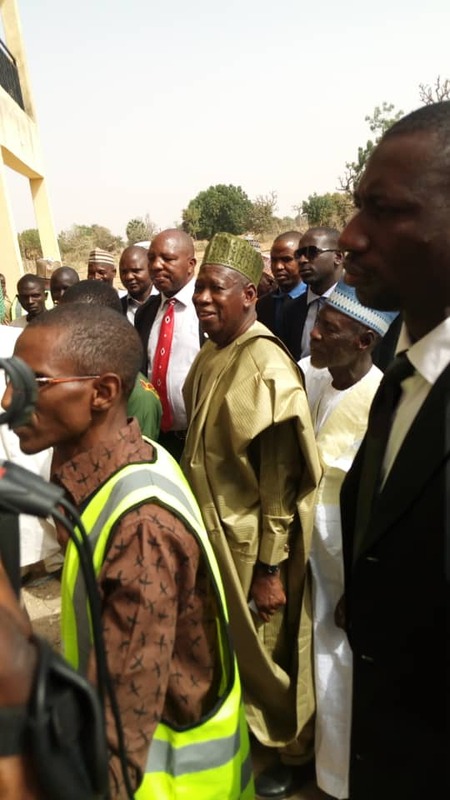 In many areas visited by PREMIUM TIMES reporter, the ad-hoc staff were not present at the time of this report. 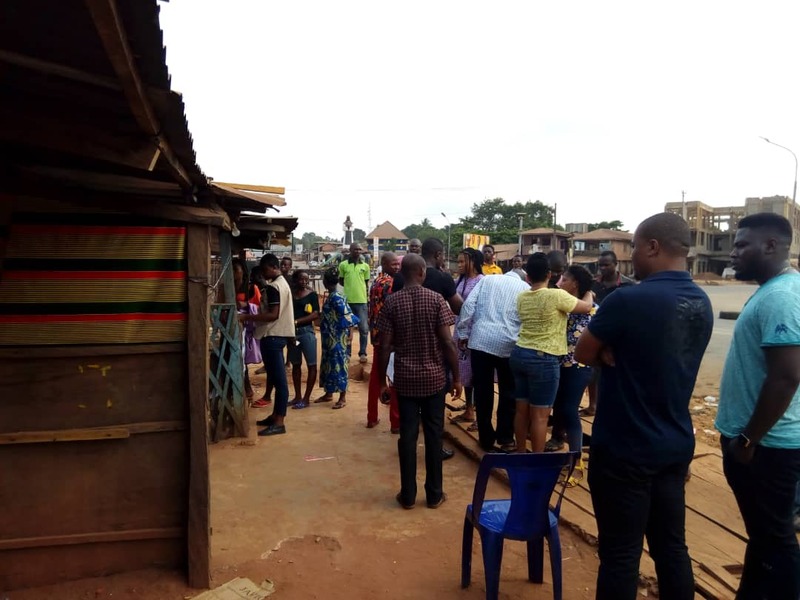 Many voters who have been on the queue since 6 am are agitated over the development. 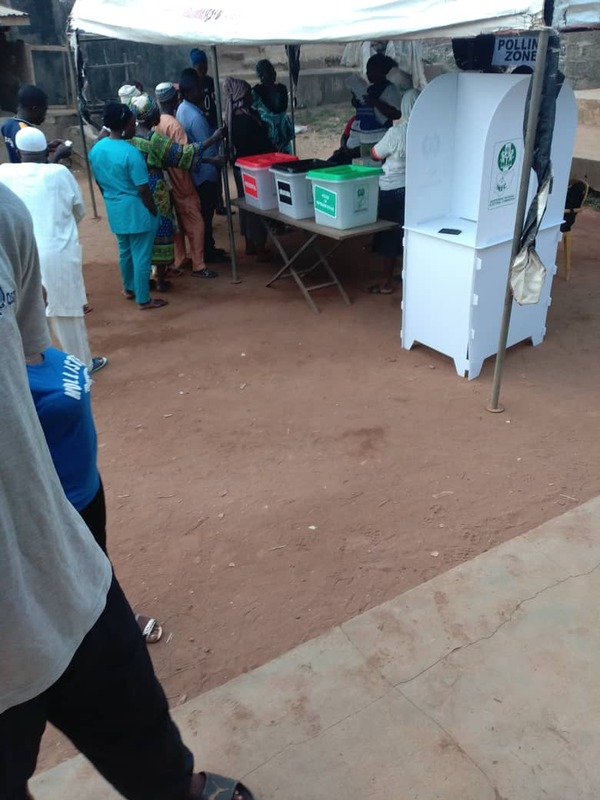 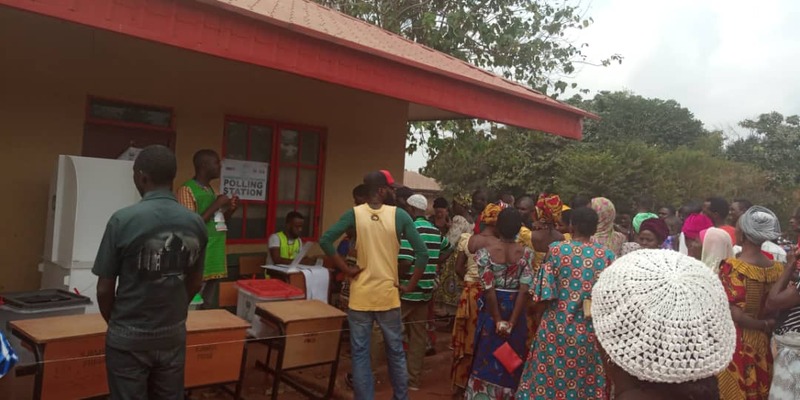 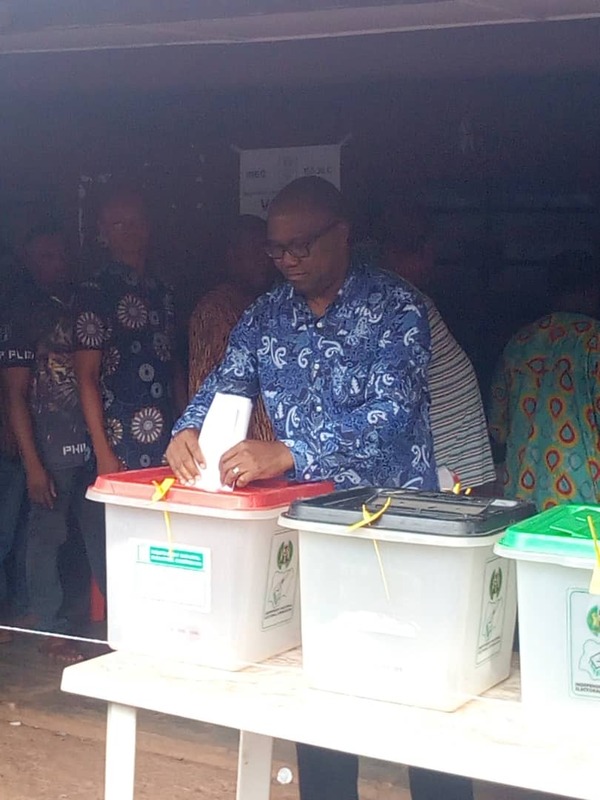 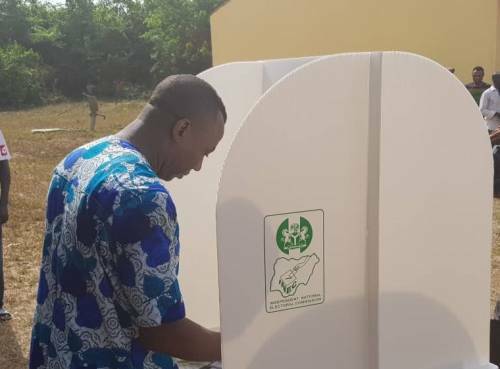 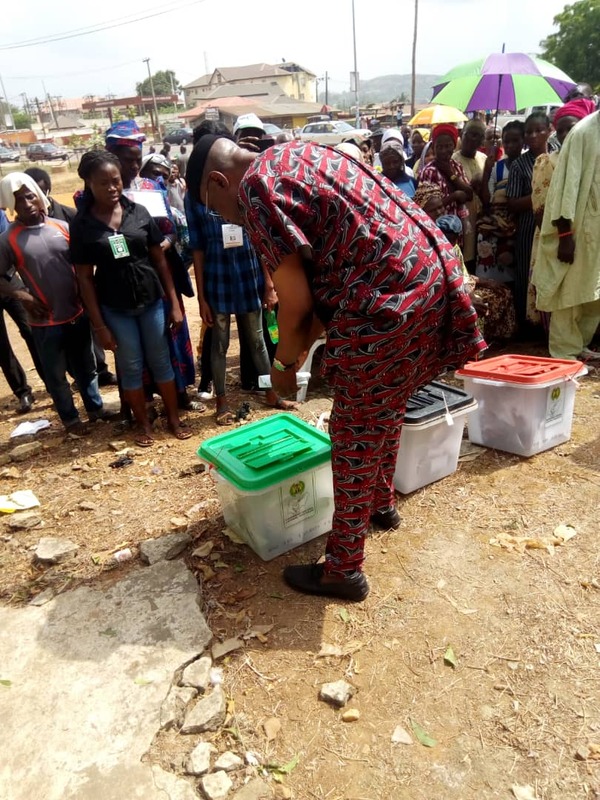 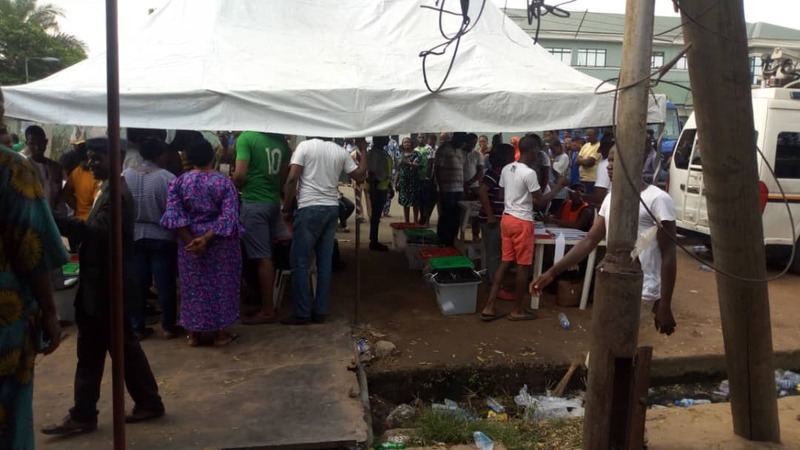 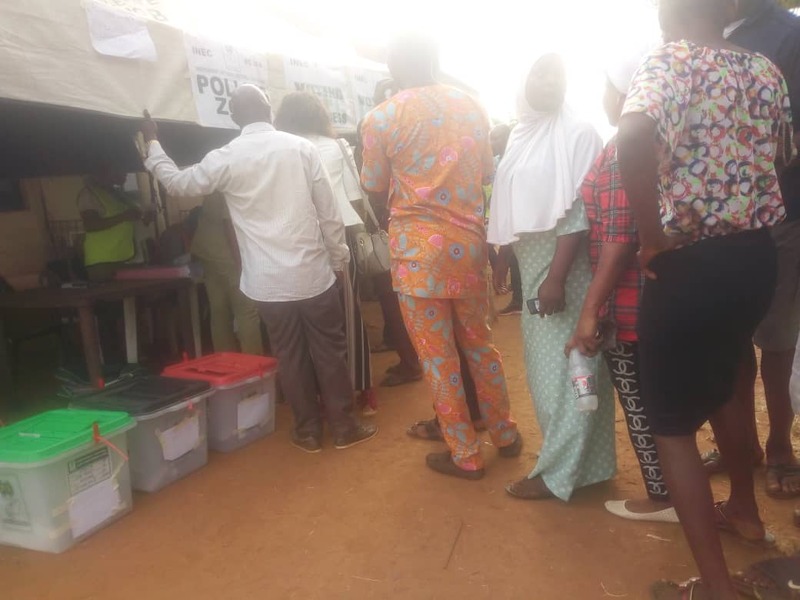 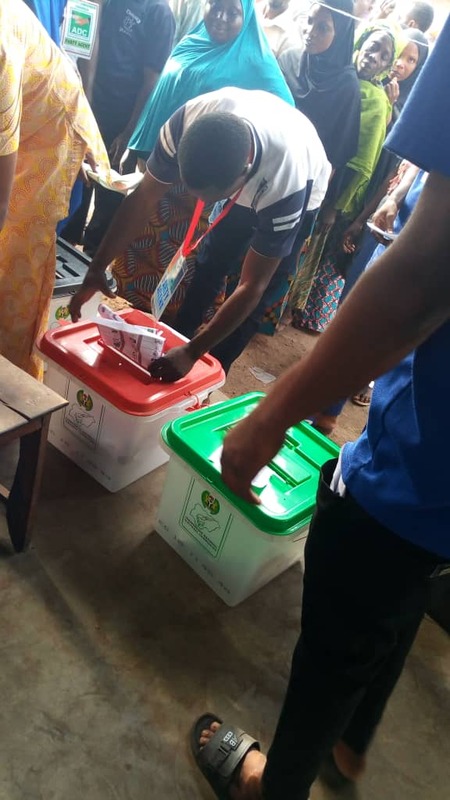 9:06 am: At Polling Unit EC 30, Agulu, Anaocha Anambra State, the polling unit of Vice presidential candidate of the PDP, Peter Obi, irregularities have been noticed as ballot box for presidential election meant to be red is seen with black lid. 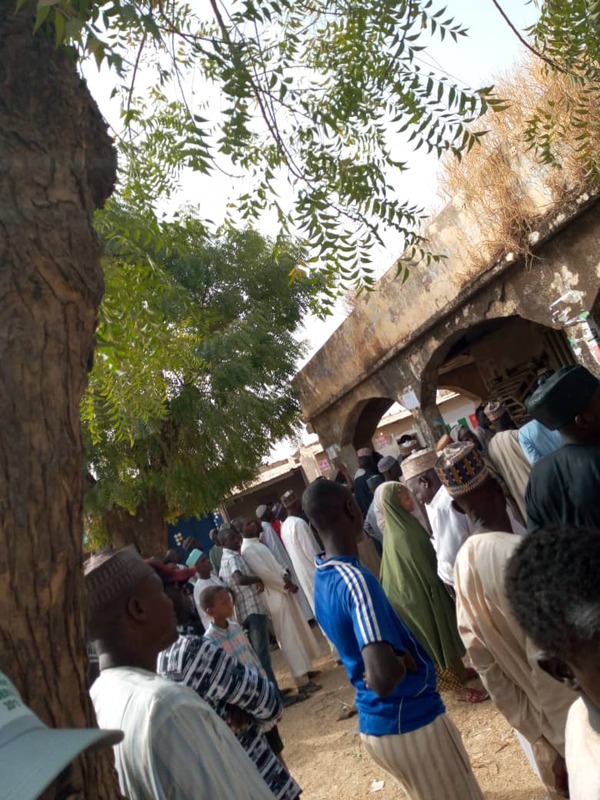 Santorial District, Kano Central, LGA – Madobi. 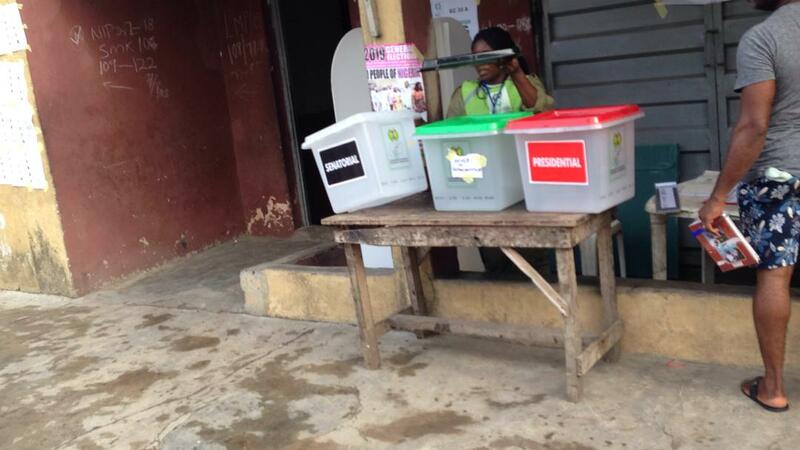 At 9:27 am Ward 4, PU 046, Alimosho Local Government, Lagos West senatorial district, Lagos state. 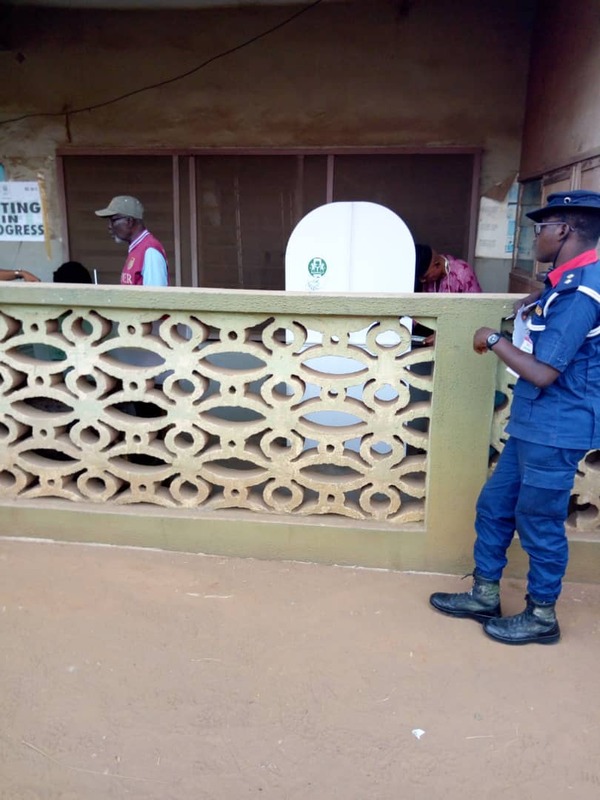 The voters are still awaiting the arrival of election officers. 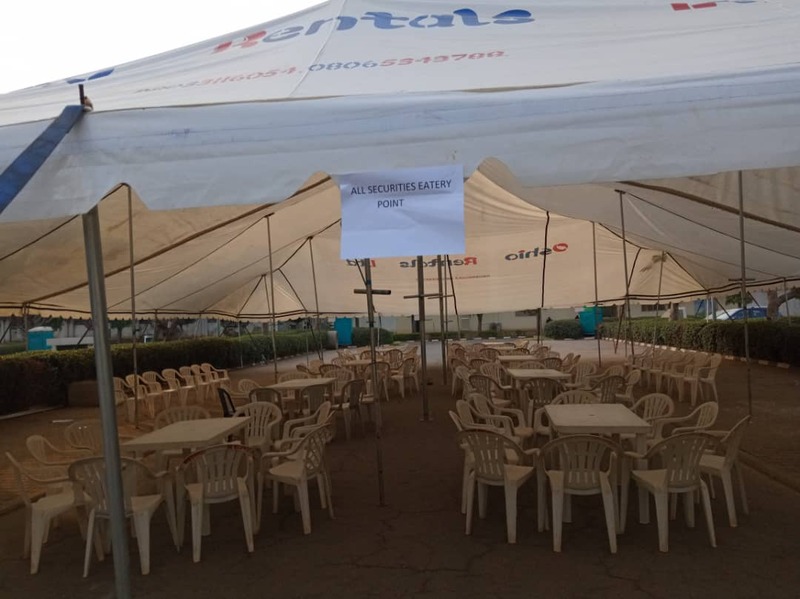 No security personnel can be seen. 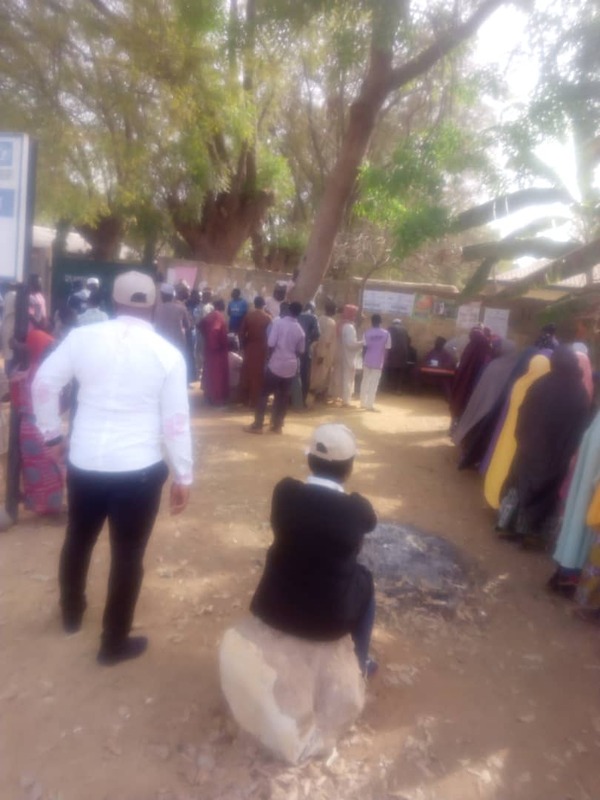 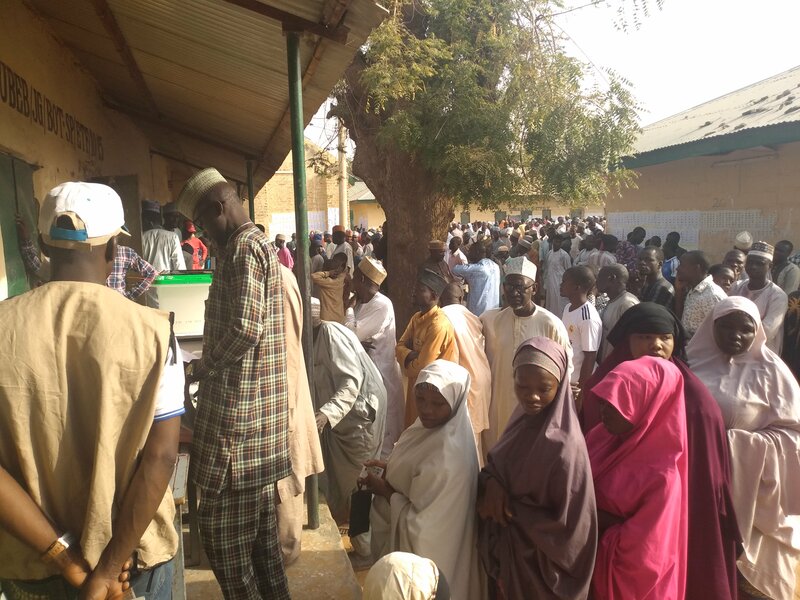 Senatorial District Kano North, LGA Rimi Gado,Ward Kofa Gari, Polling Unit 09 and 10, Time of Visit 9:26, Situation Report The adhoc staff in this polling units said they started voting at 9am and everything moving smoothly. 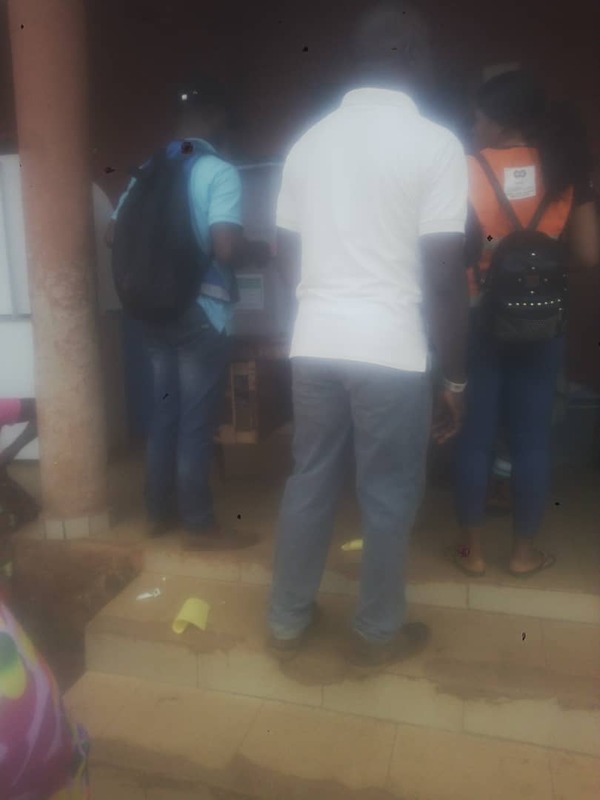 9.22am umuora square PU6 Awka North, Anambra Central: voters in queue as they await authentication of their PVCs. 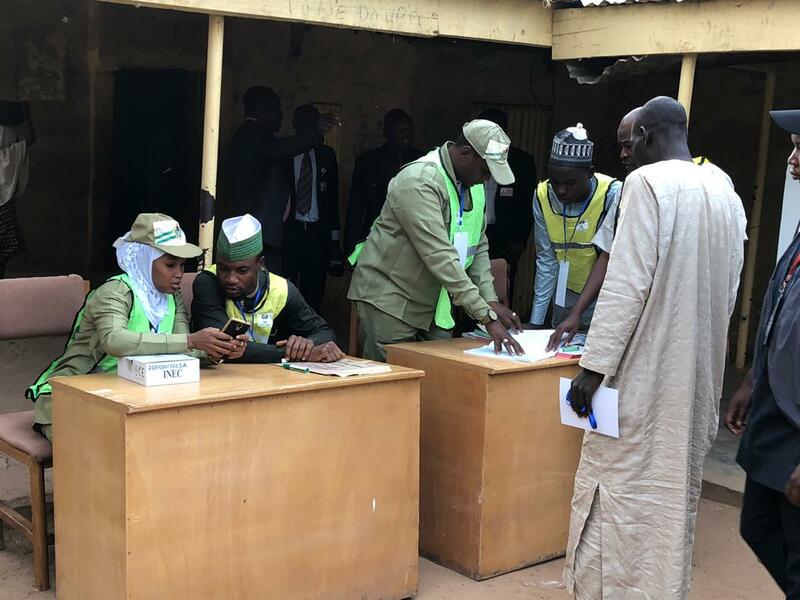 The presiding Officer said the SCR read the cards but fail to authenticate them, he has called the technical support and they are on their way. 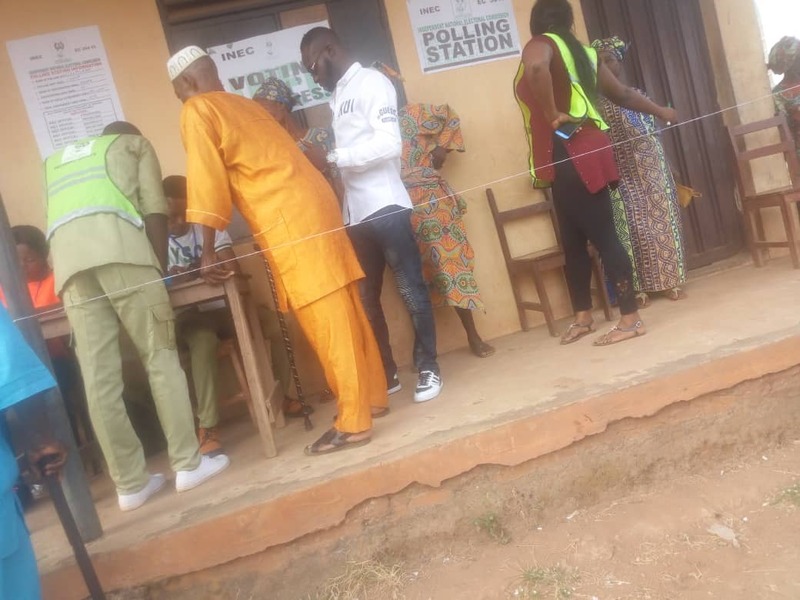 9:22 am. 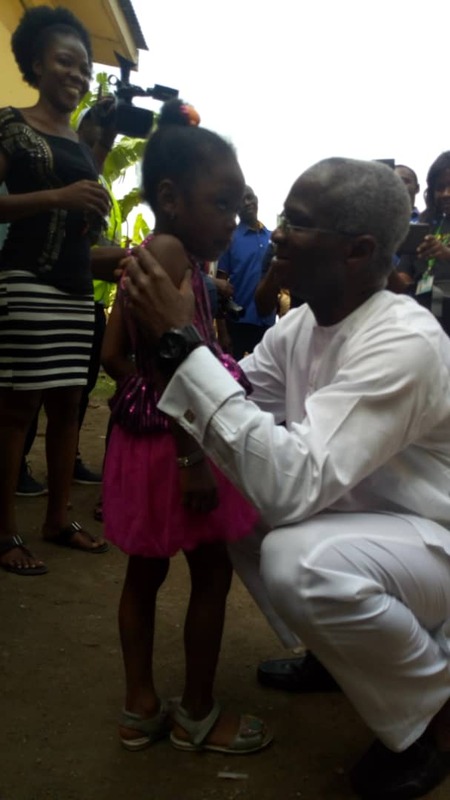 At Akho Pry Schl PU 001, Irrua, Esan Central LGA, Edo Central Senatorial District. 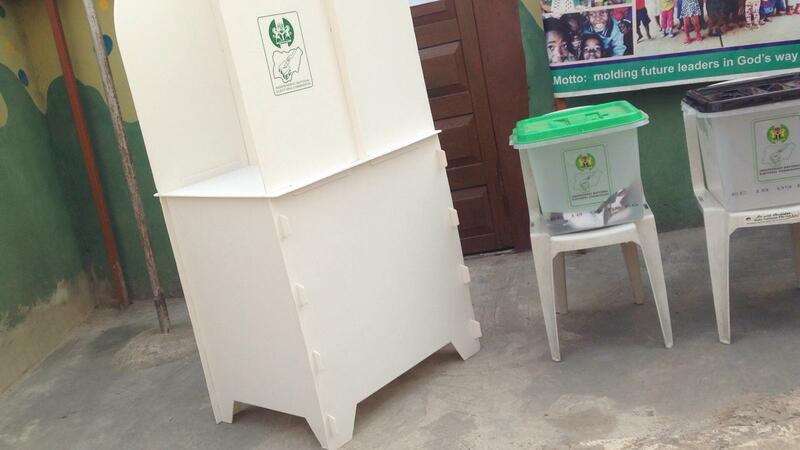 There are 2 voting points.There are complaints that the ballot papers are not complete. 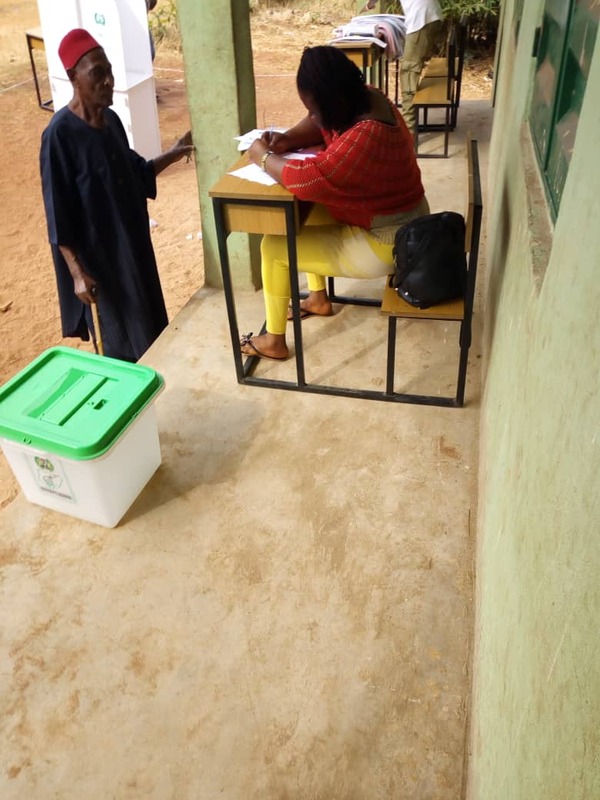 The voting is yet to start and there are contemplations on the next step to take. 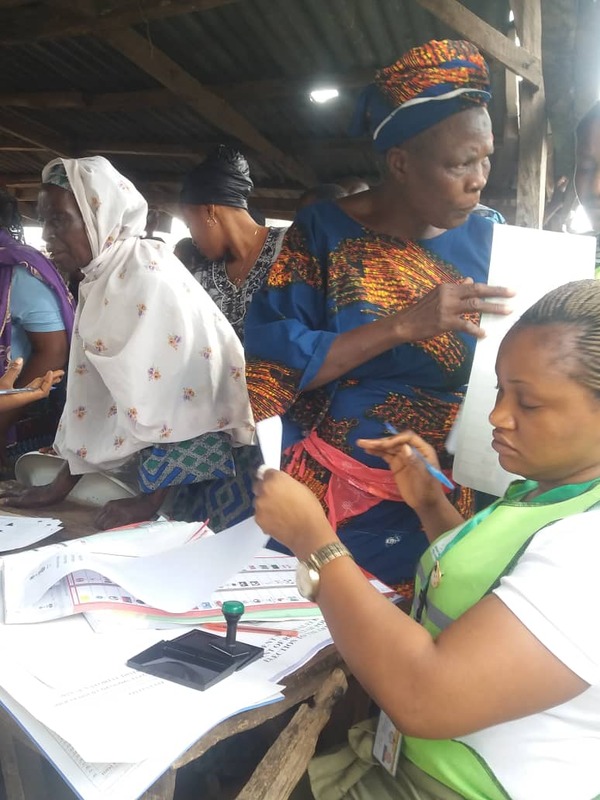 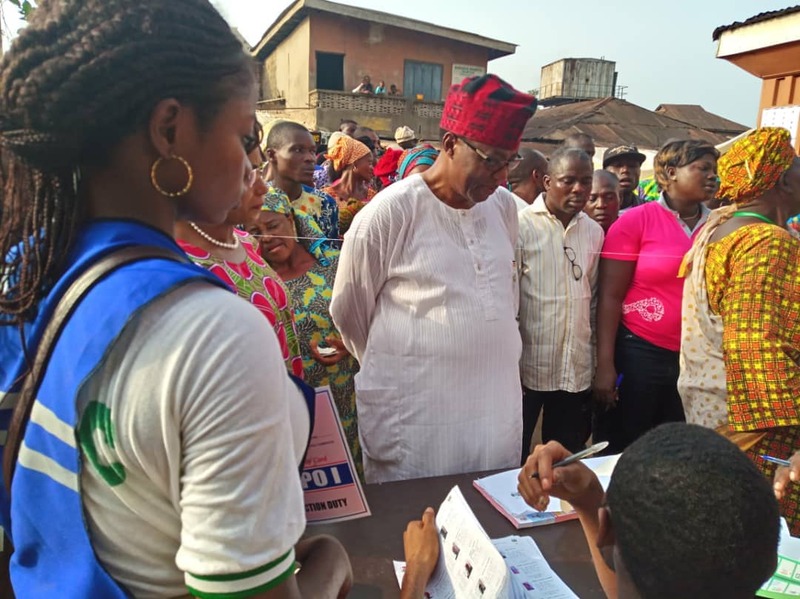 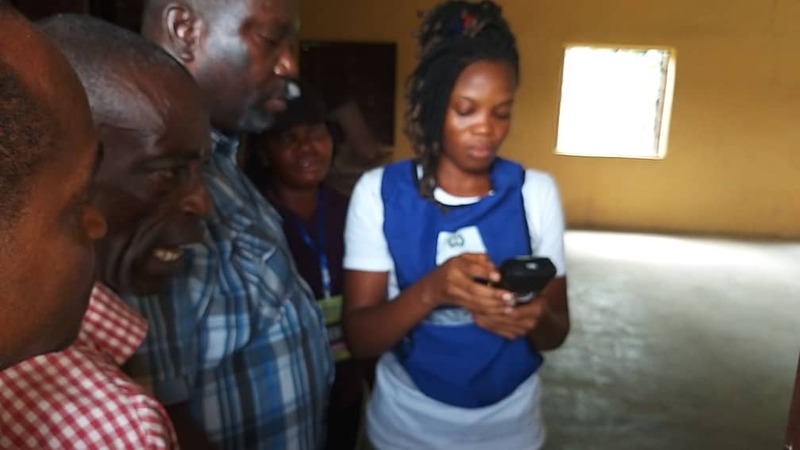 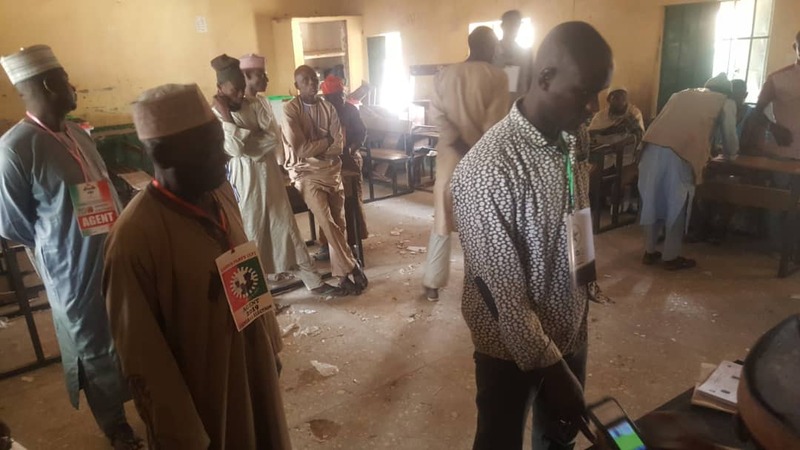 The voters are growing impatient, party agents are arguing with the Ad-hoc staff because the card reader is showing invalid date in one of the VPs. 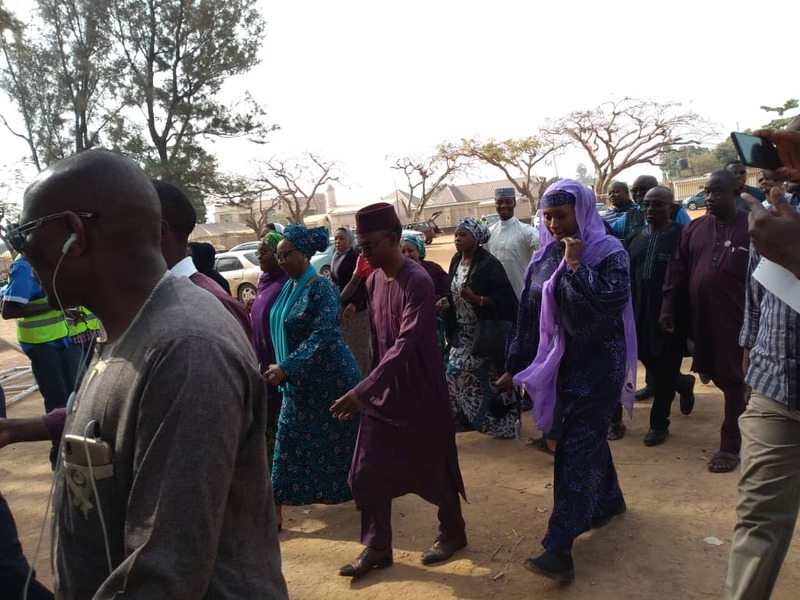 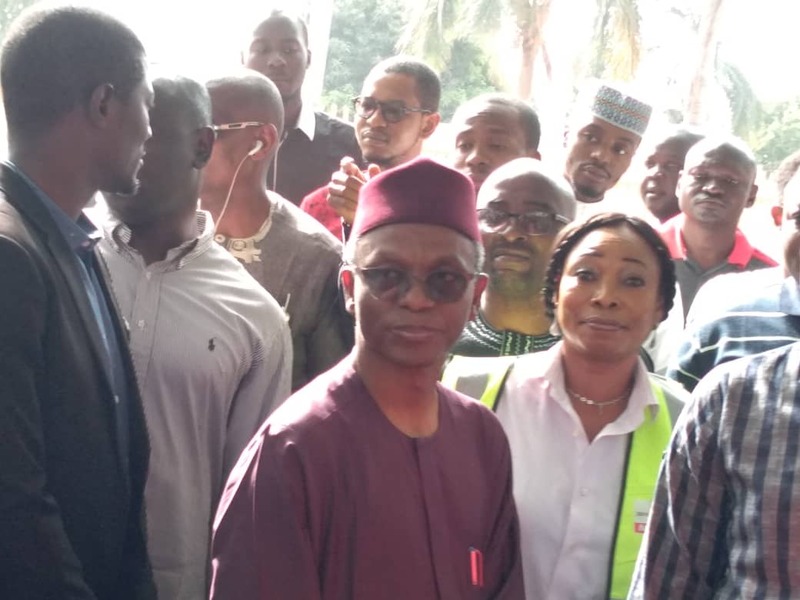 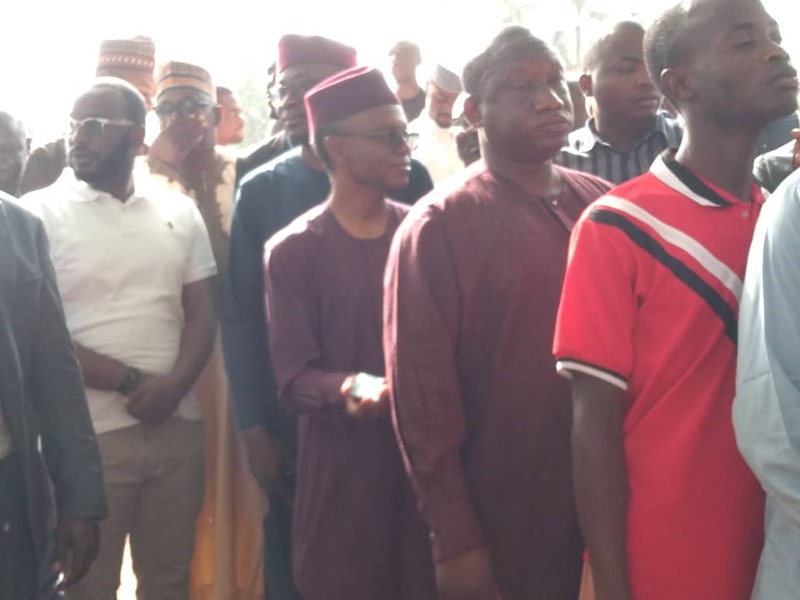 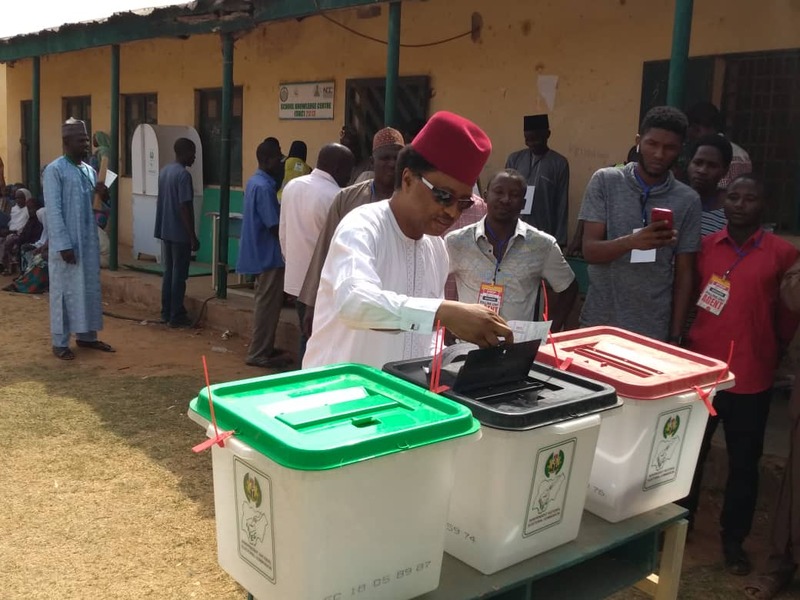 El-Rufai on queue at polling unit 024,Ungwar Seriki ward. 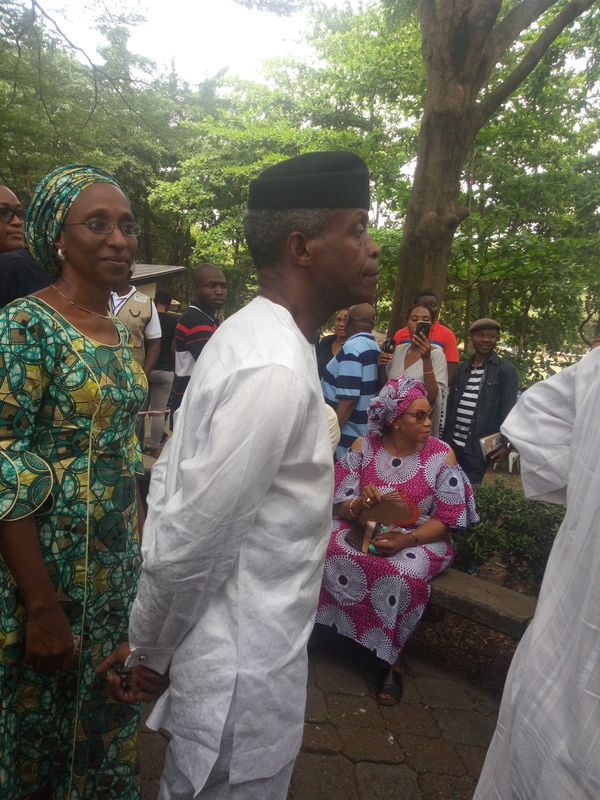 He arrived with his wife by 9.20a.m. 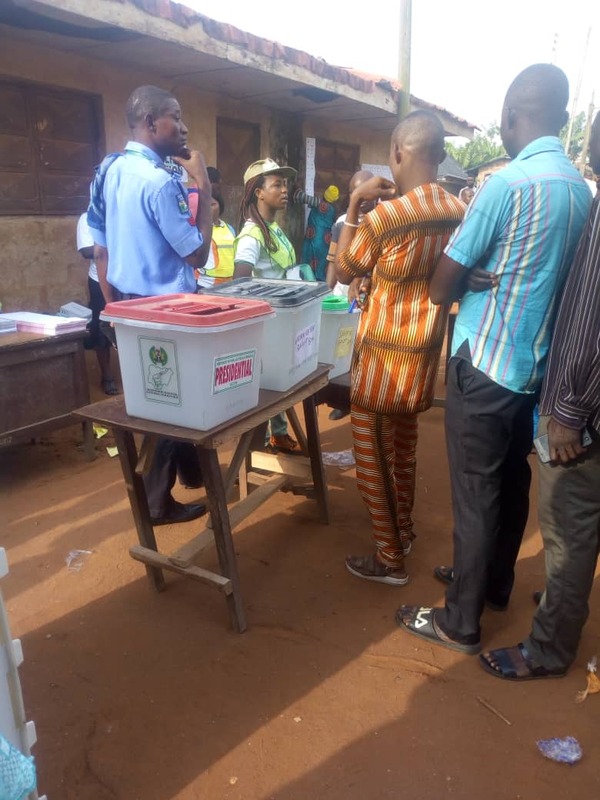 @9:22 Ward 01 PU 011 Shomolu Lga Lagos East. 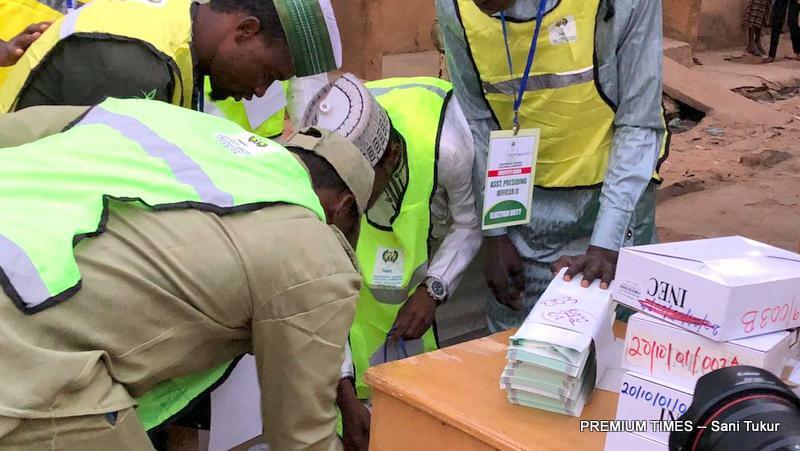 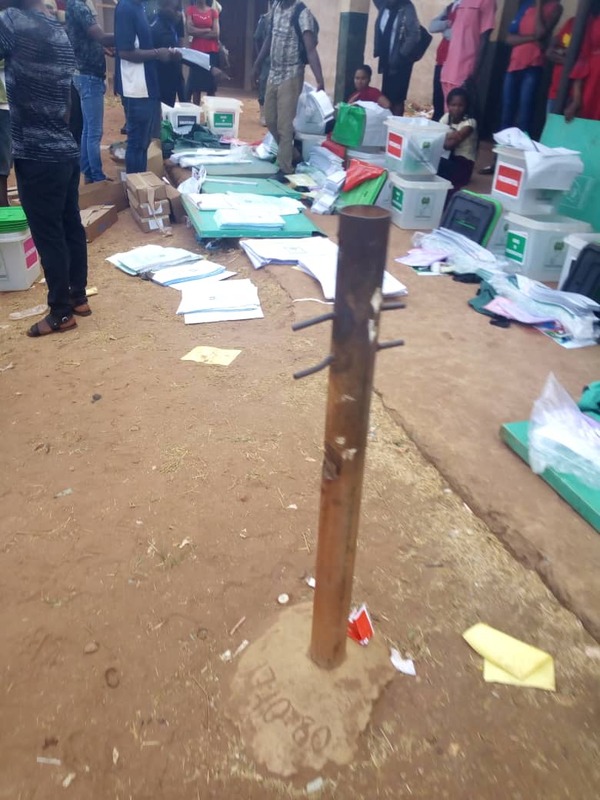 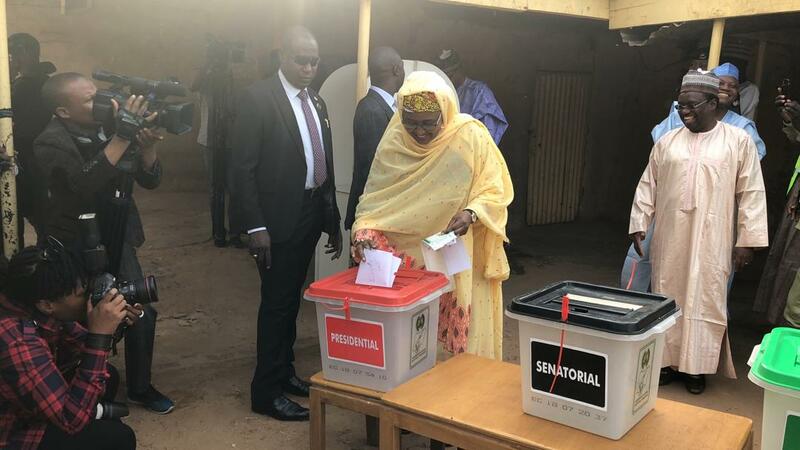 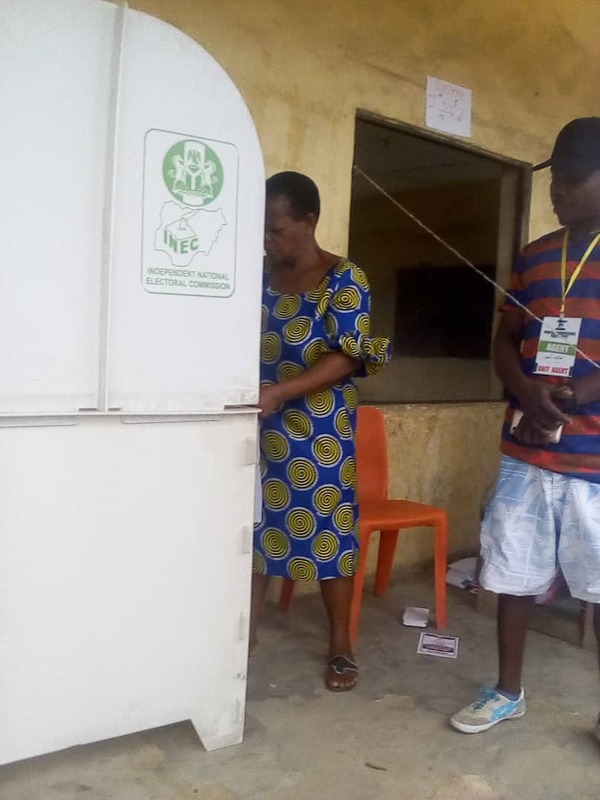 One of the ballot boxes leaking and INEC officials use paper to block it. 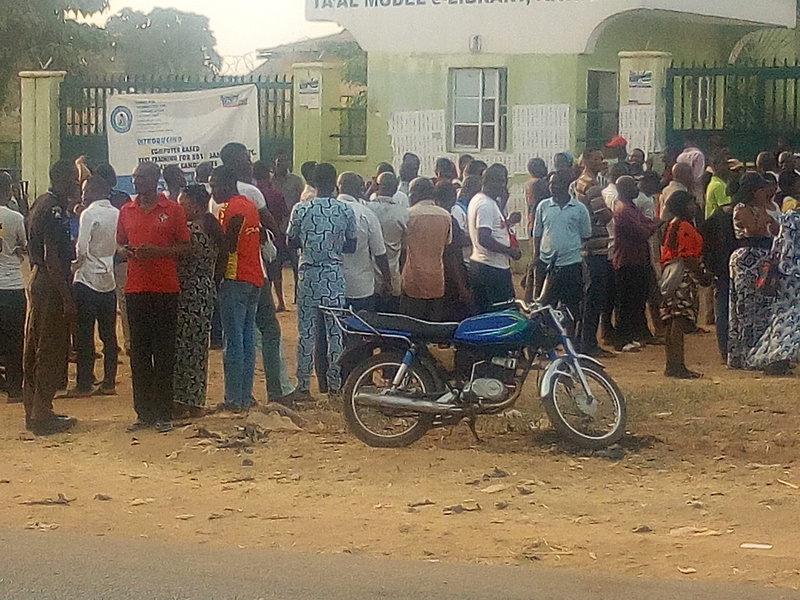 I am at the LGA INEC office. 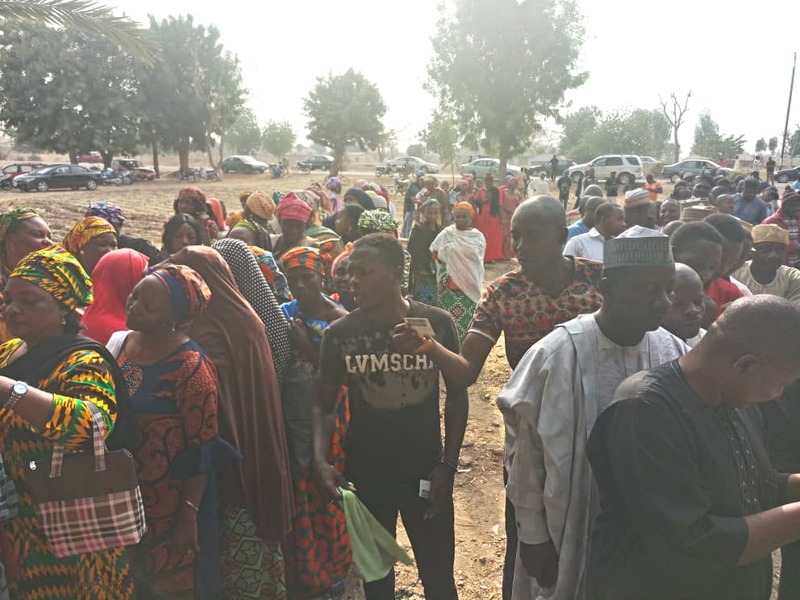 Materials are yet to be distributed at this moment, voter are waiting for the inec officials and they expressed their dissatisfaction to the situation. 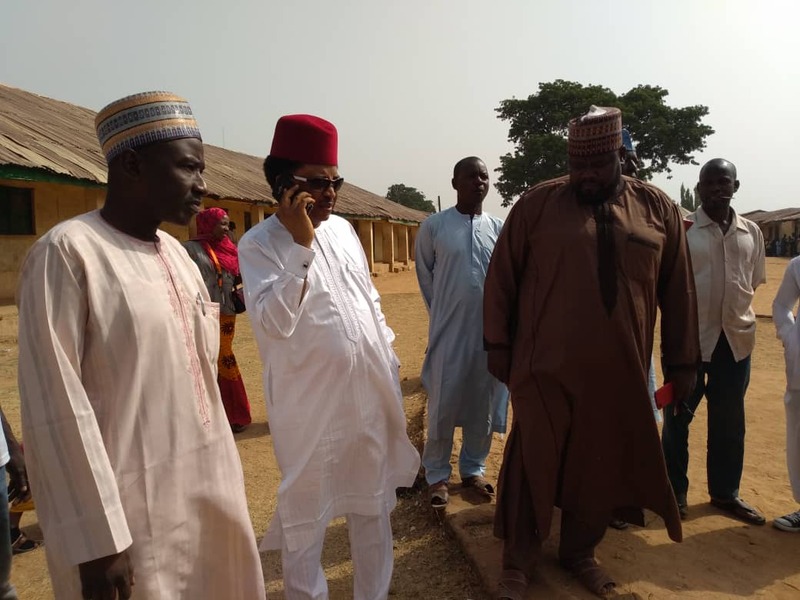 Gabas primary school, Babura LG, Jigawa state, ward: 003. 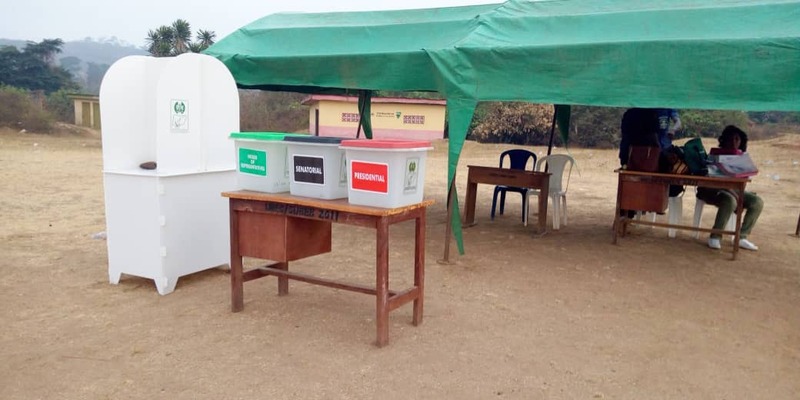 All is set voting is about to begin when they actually started complaining about having only one ink. 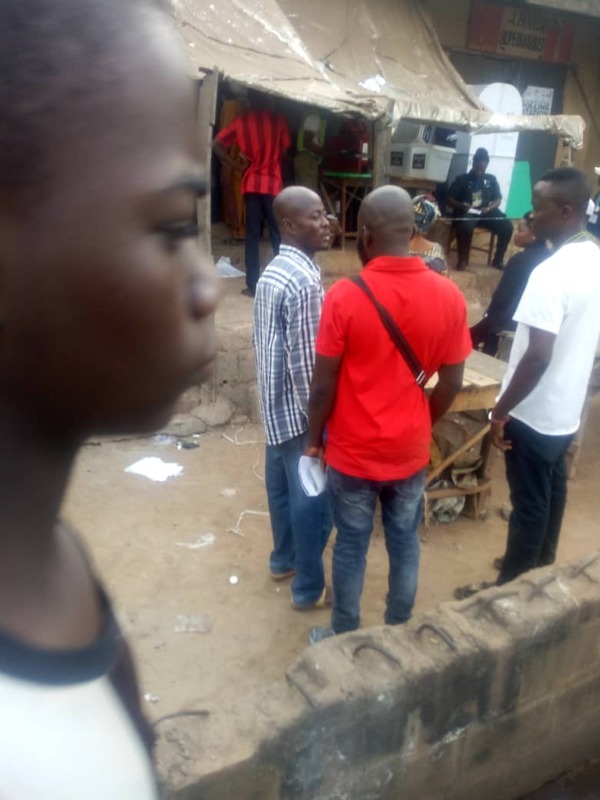 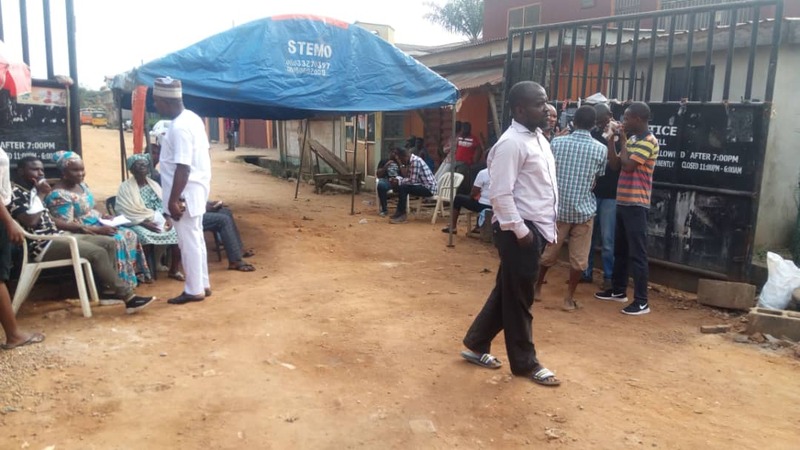 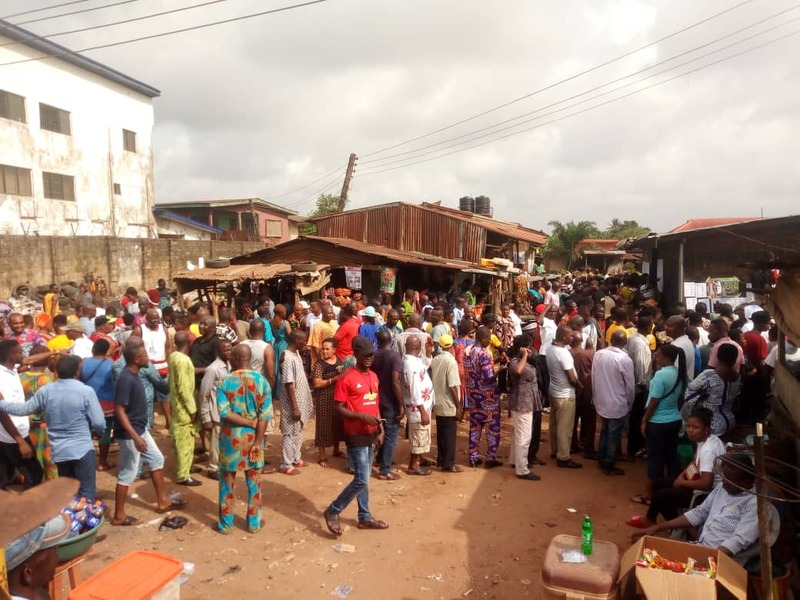 9:21am, Edo State, Egor Local Government, RA 04, Egor, PU 007, Topper Garage/Market Square, Egor 1 – voting is yet to commence and there are 3 voting points, However the voters list has been pasted on the wall, people have formed a long queue but the election officials are yet to set up the materials due to their later arrival and the overwhelming crowd. 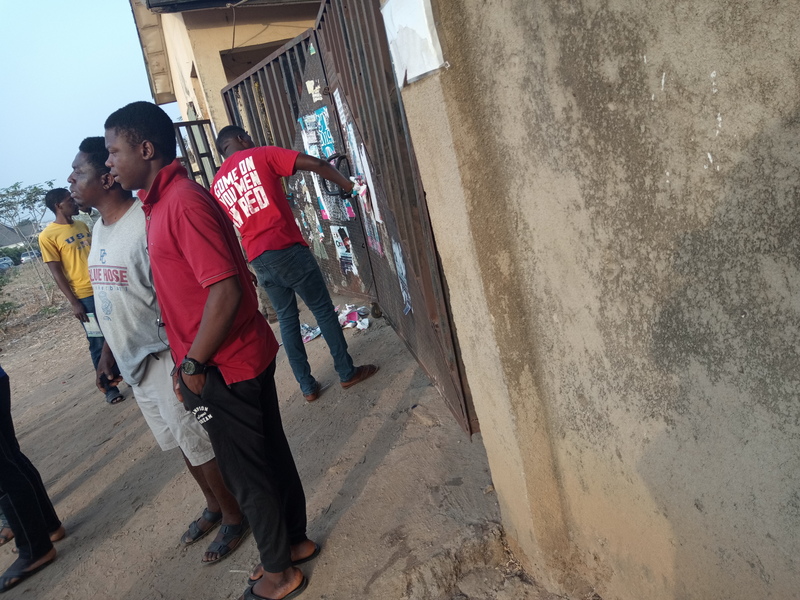 SOME NSCDC OFFICIALS SEEN TROOPING IN AND WEILDING GUNS AT THE POLLING UNIT, CHASING AWAY WANDERERS. 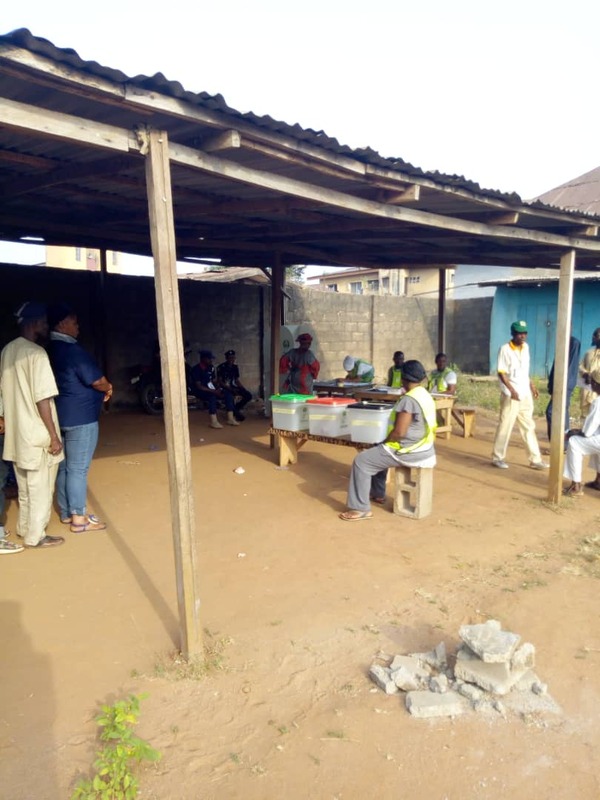 @9:14am Ward 01 PU 011 Shomolu Lga Lagos East. 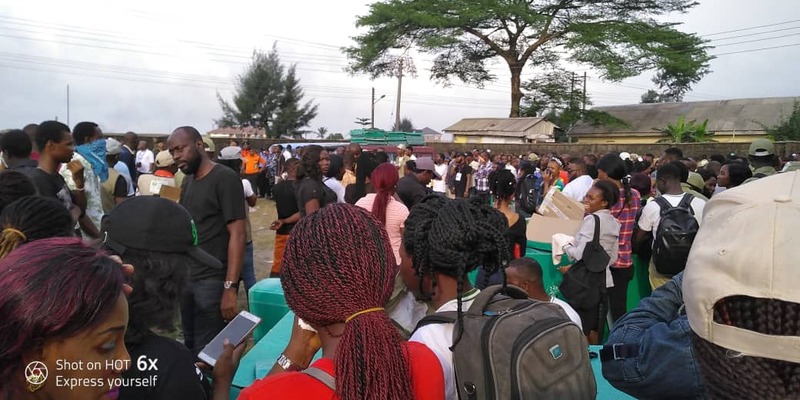 Voters list yet to be pasted as INEC officials are in the wrong polling Unit. 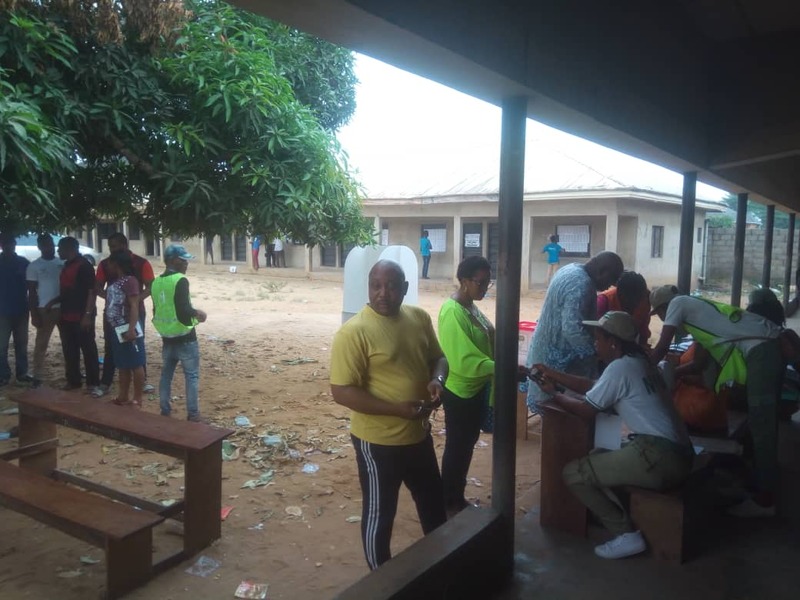 8:57am, Edo State, Okungbowa Primary School, Agbonmoba, Ovia North East LGA, Okada – no presence of INEC officials at this polling unit. 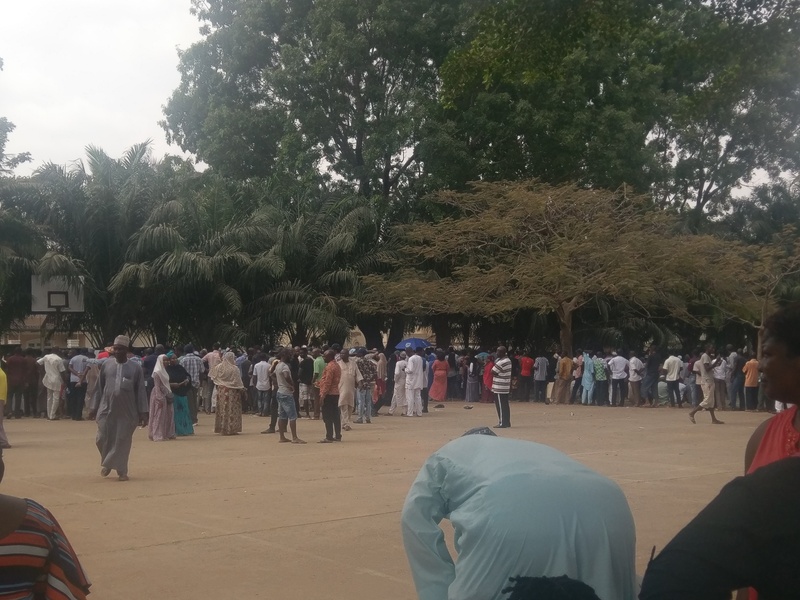 The voters are displeased with this situation as they have been waiting under the tree to exercise their civic duties. 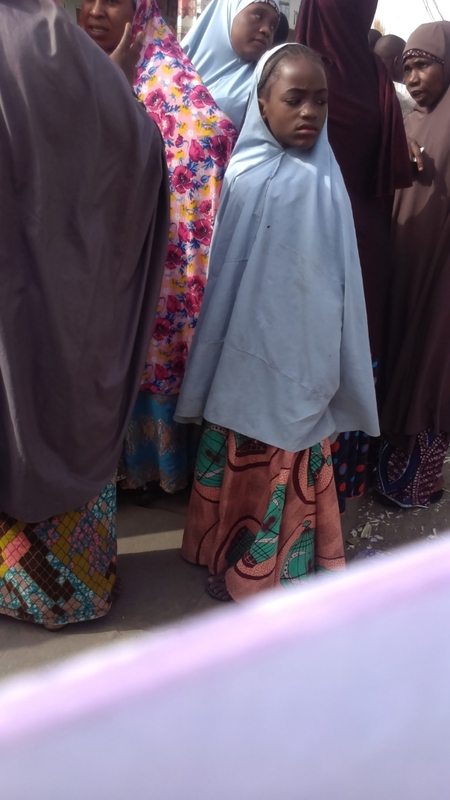 9:06 am: Awgu LGA. 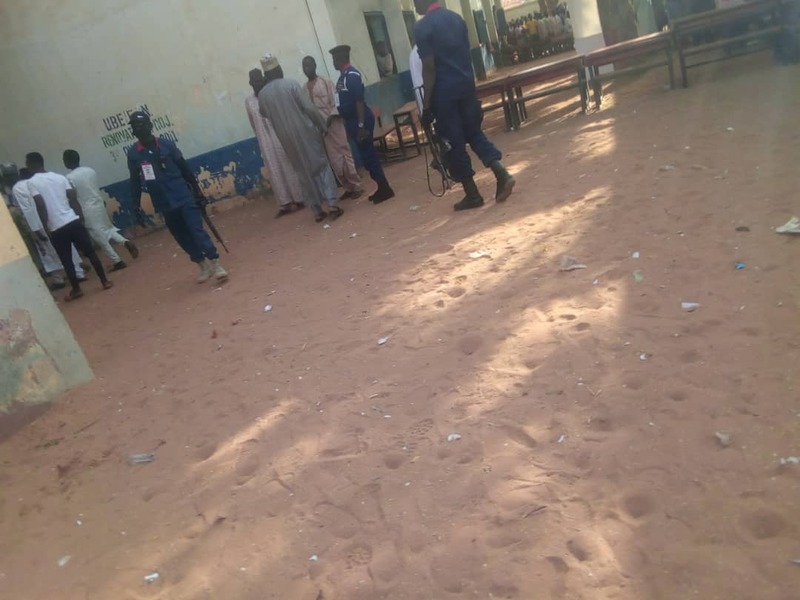 Ward, 01. 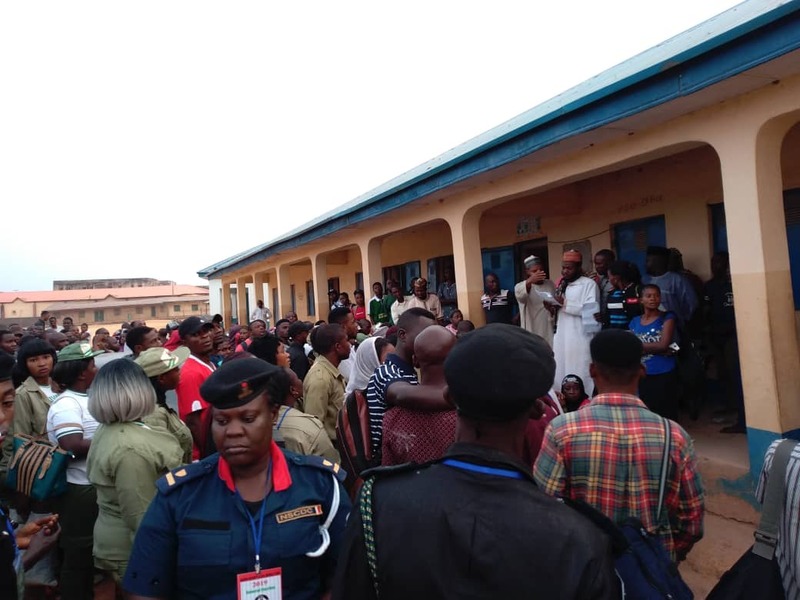 PU 008, Enugu State, voting about to commence as the PO addresses voters and reading out rules of voting. 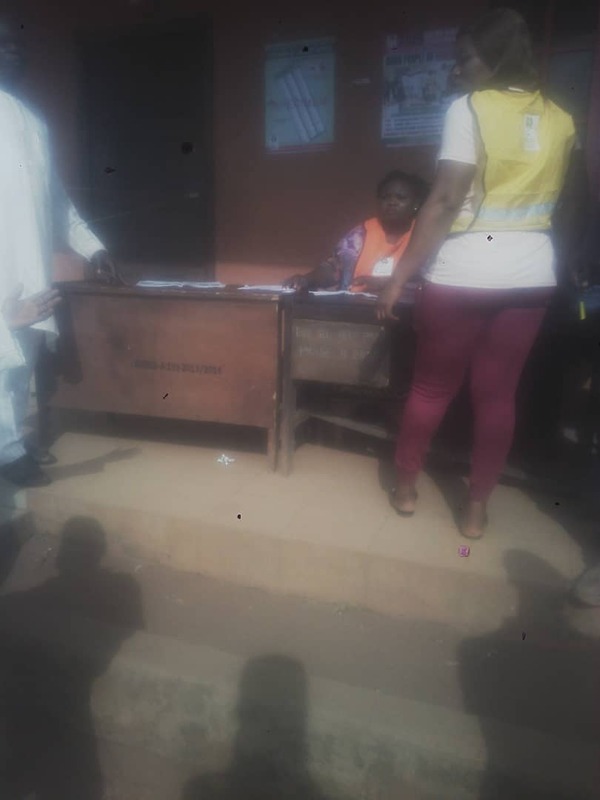 8:50am: PU 0013 kofar CD, Obi local govt of nasarawa state..
8.50am Demonstration PRI SCH Awka south LGA, Anambra central PU1VP1 uproar as SCR reads card but doesn’t read finger. 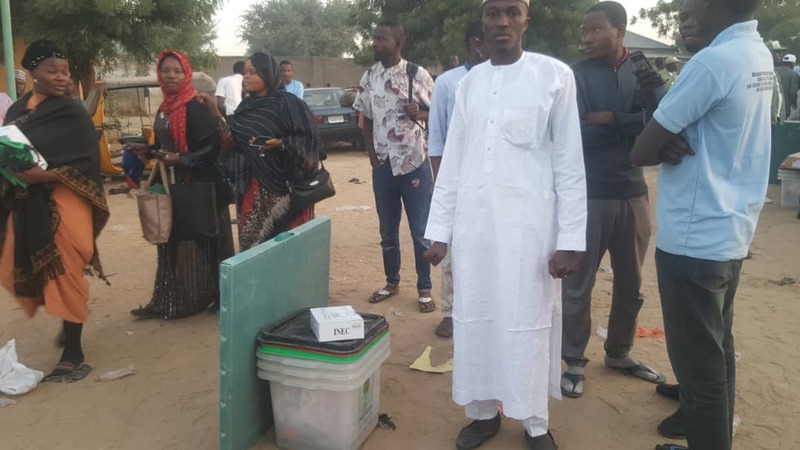 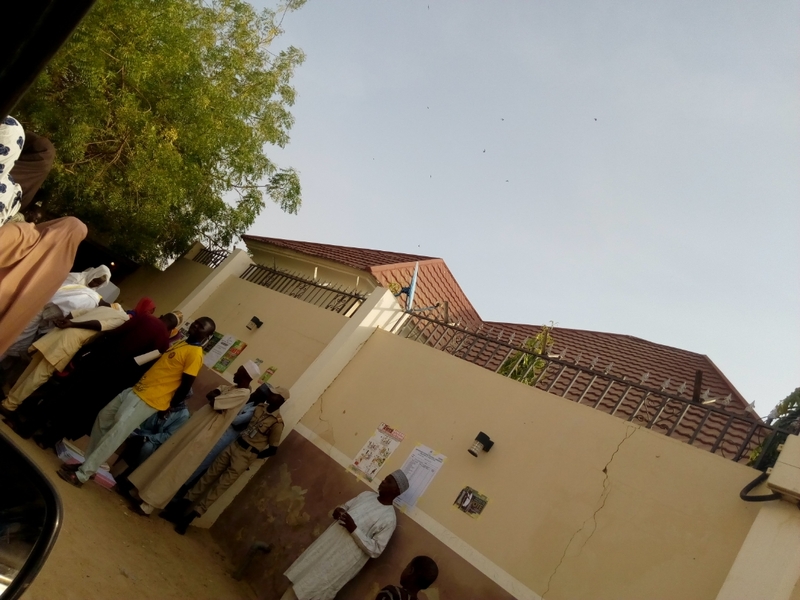 Over 30 minutes after the commencement time stipulated by INEC, accreditation and voting is yet to start in many polling units in Kaduna, the Kaduna State capital. 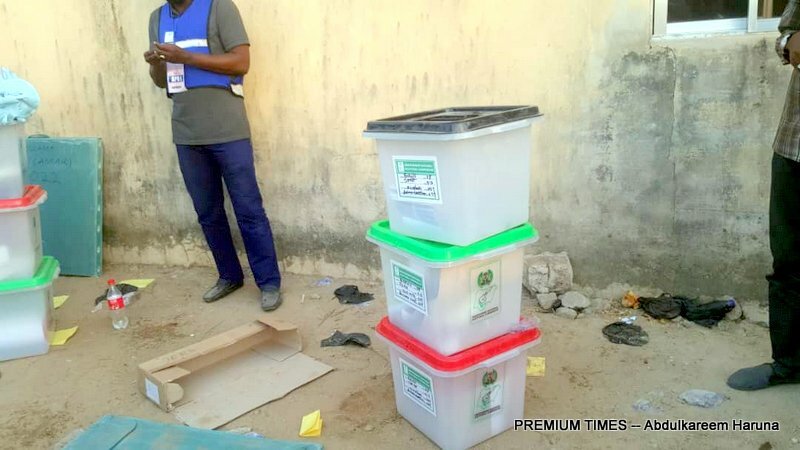 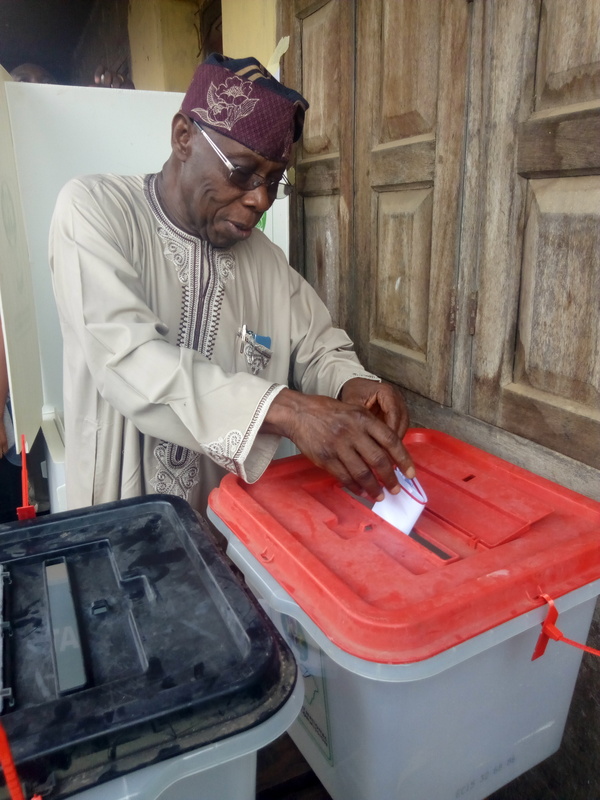 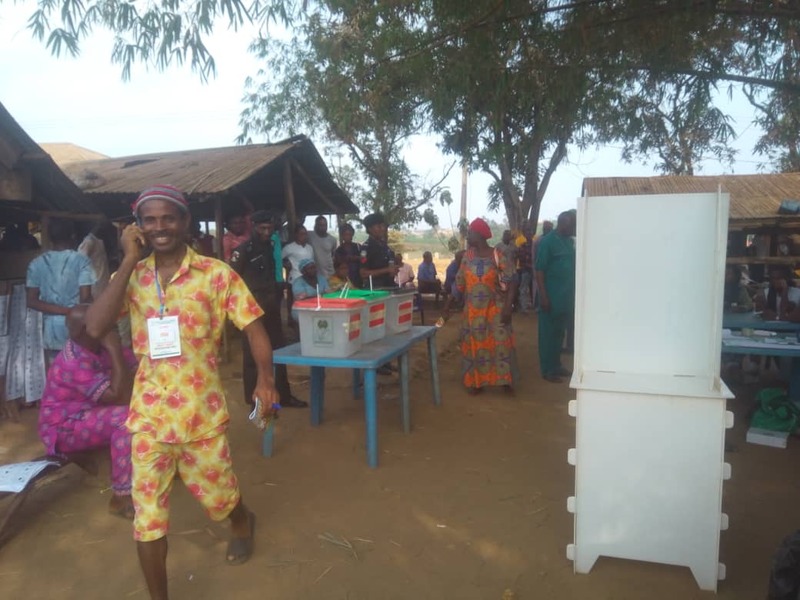 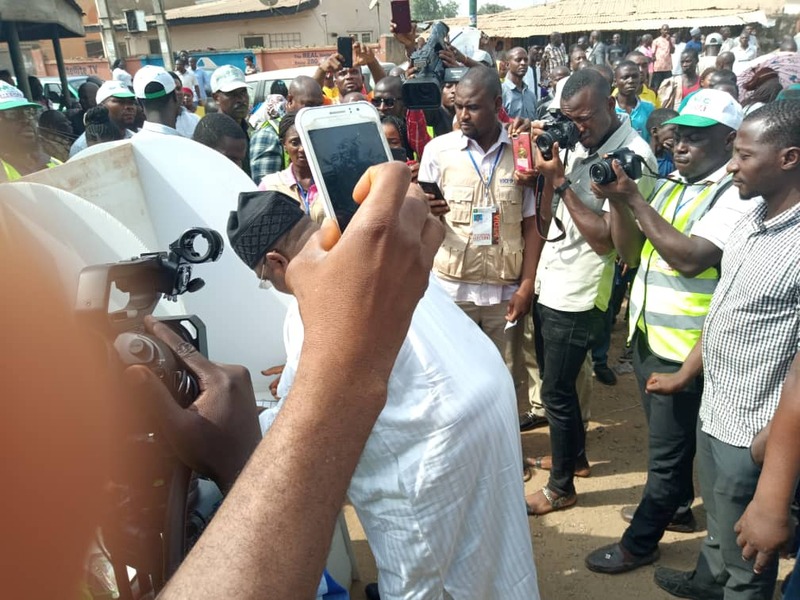 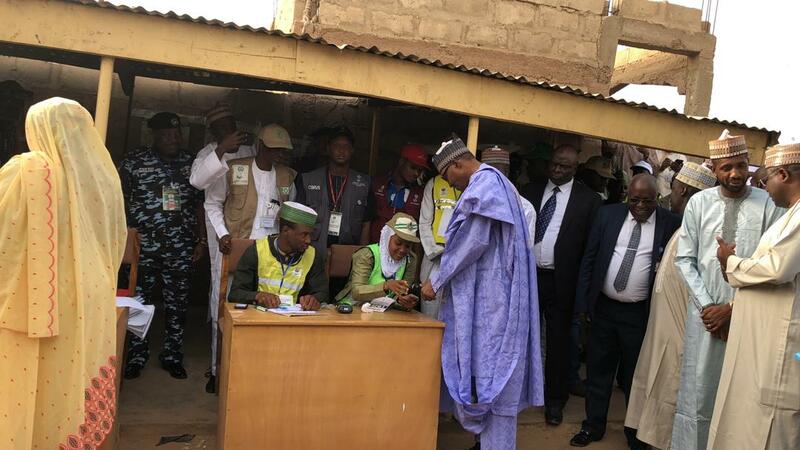 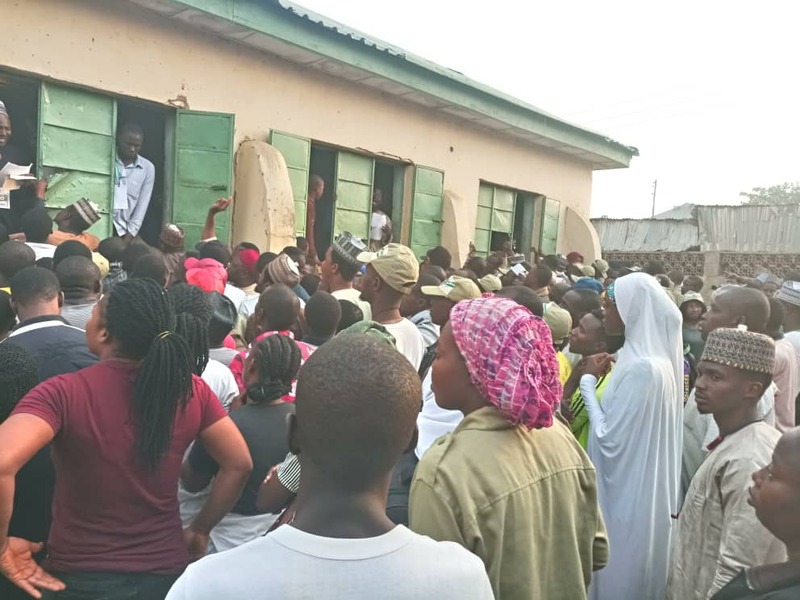 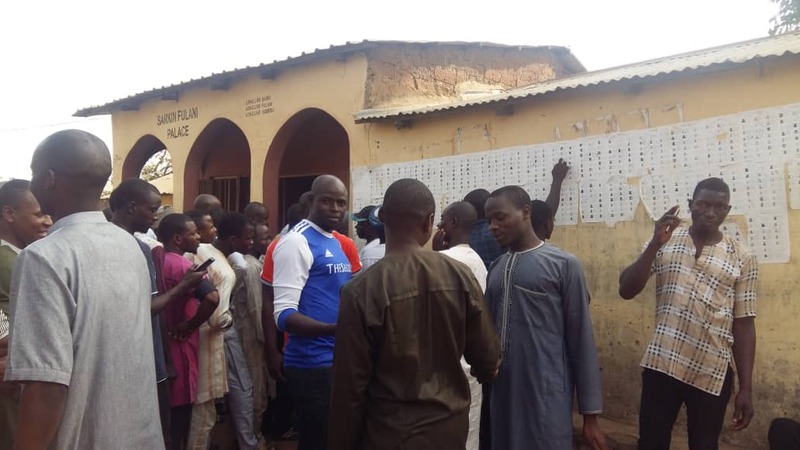 PREMIUM TIMES reporter visited about 15 polling units in Sabon Tasha, Kakuri, Romi and Trikania areas. 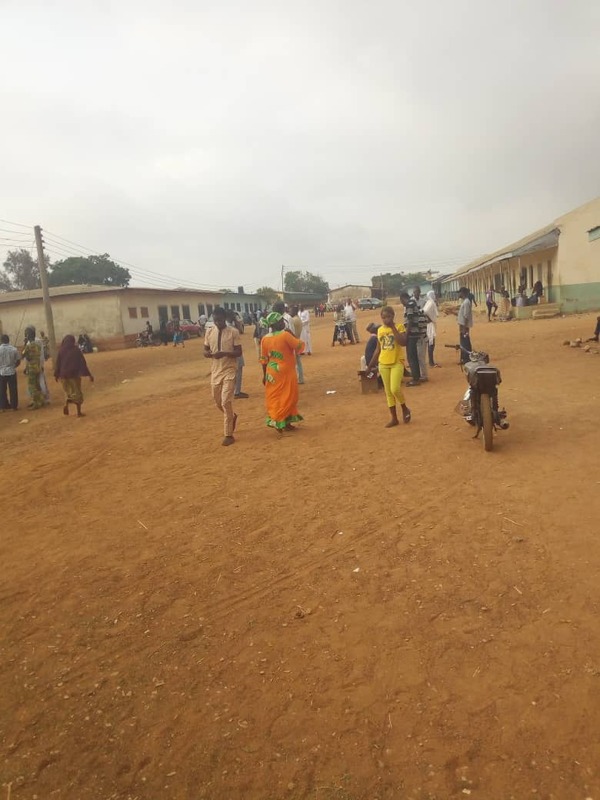 The areas fall under Chikun and Kaduna South local governments. 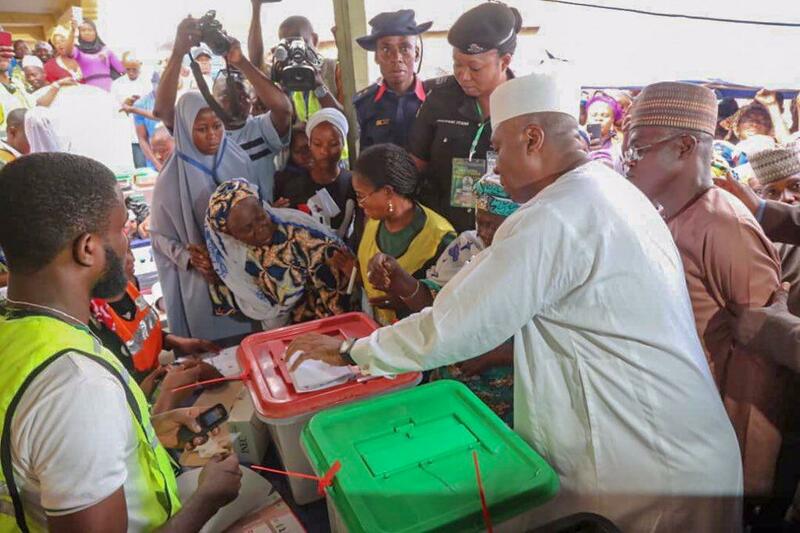 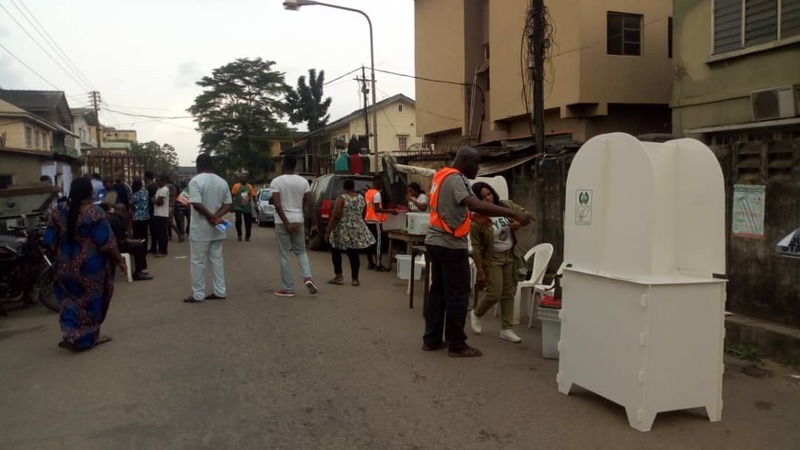 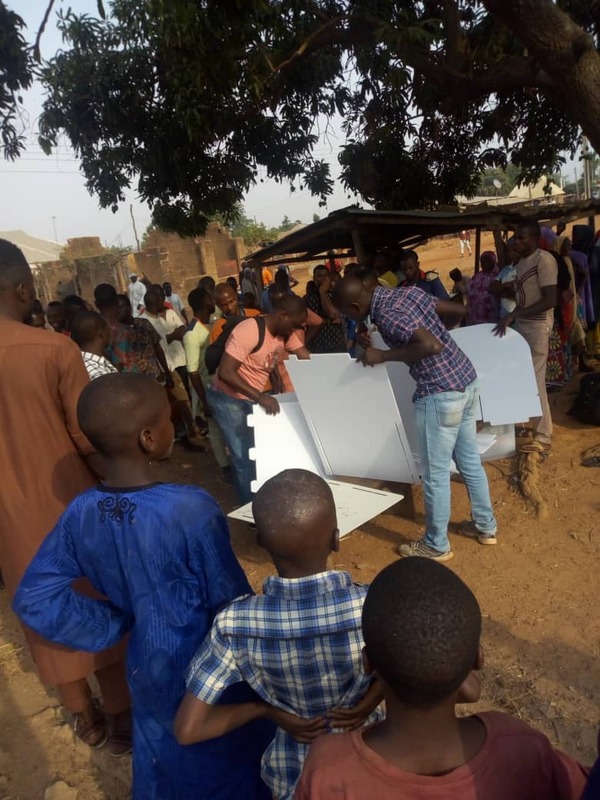 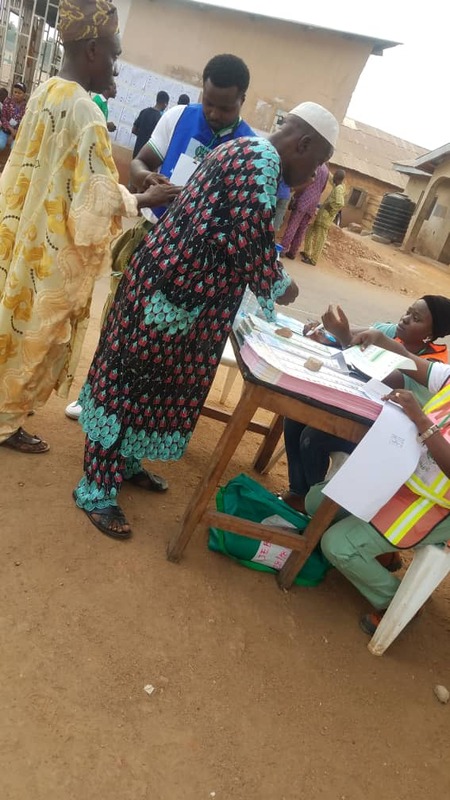 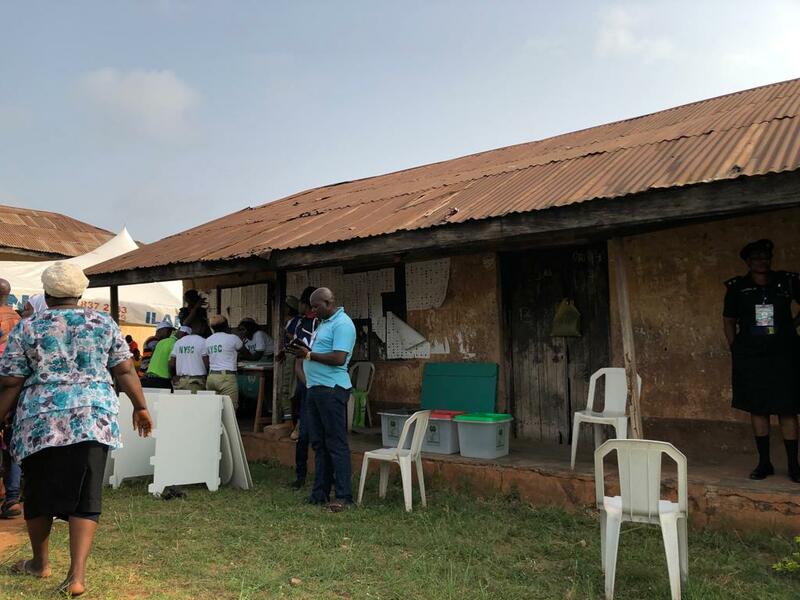 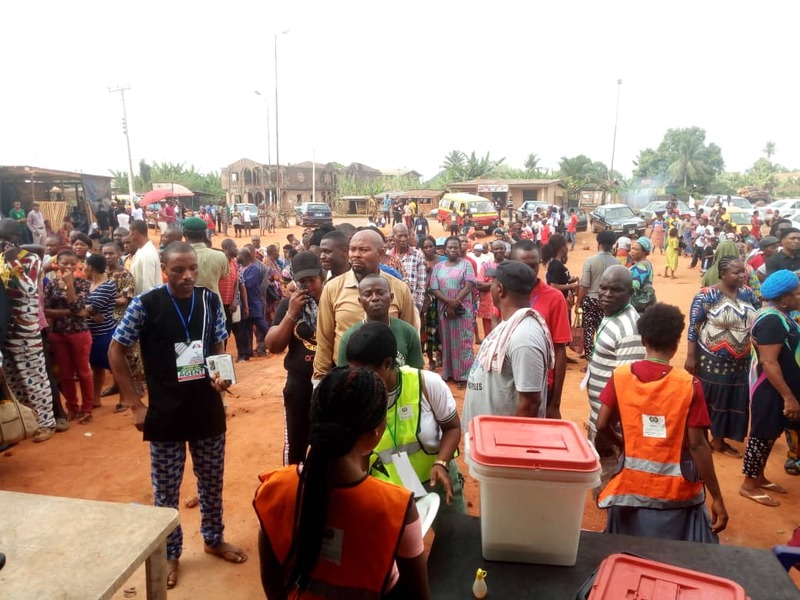 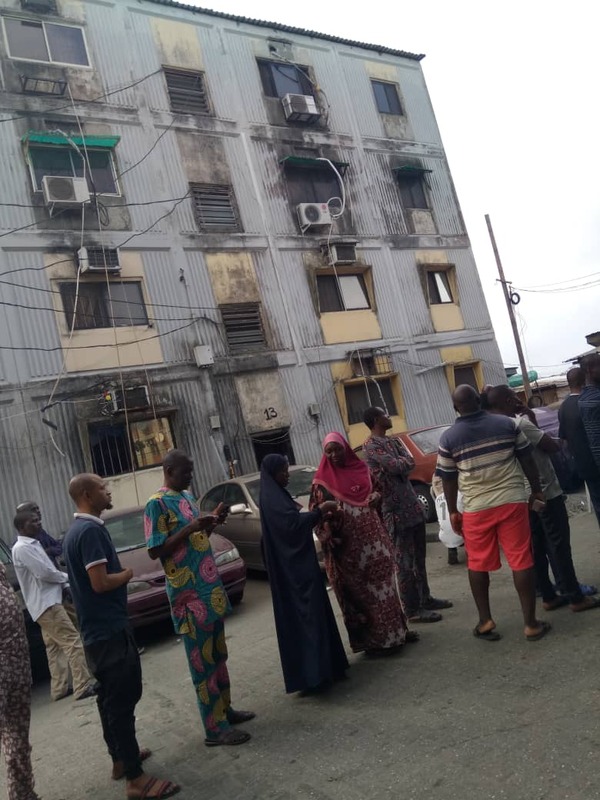 Some minutes past 7 a.m., Saturday morning, INEC officials were seen distributing materials to ad-hoc staff at Chikun LGEA primary school. 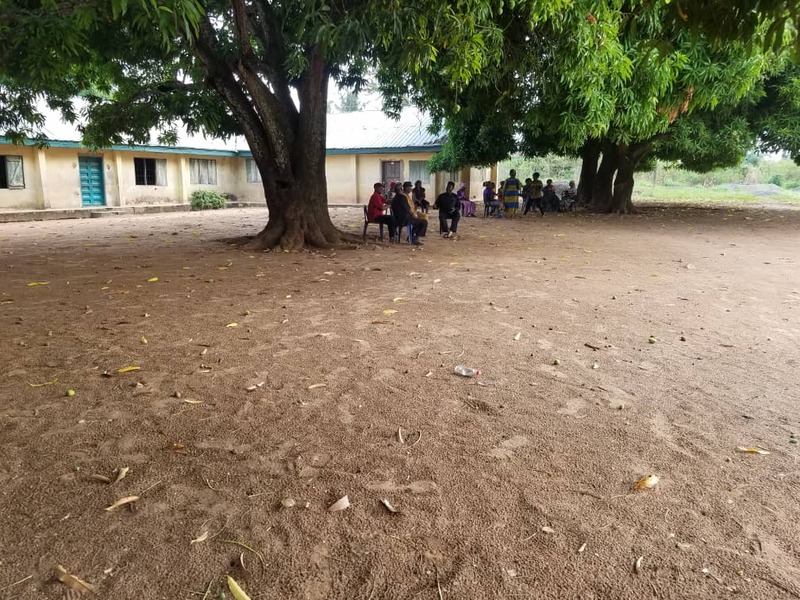 The school served as a RAC centre. 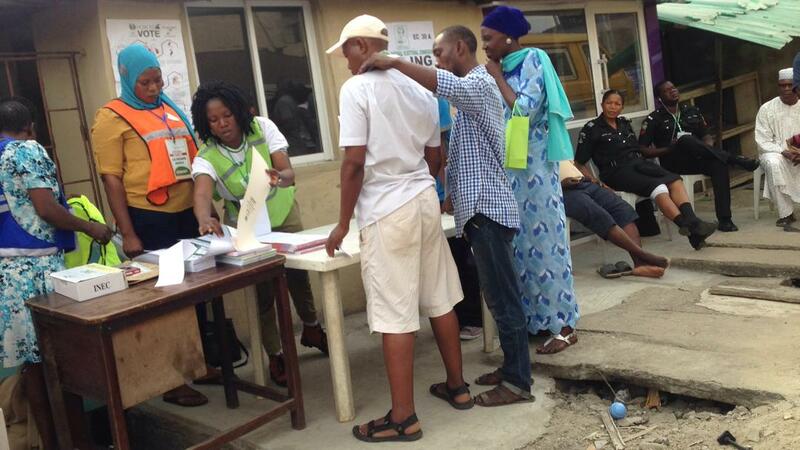 At another RAC centre In Sabon Tasha LEA Primary School, the exercise was still ongoing by 8.30a.m. 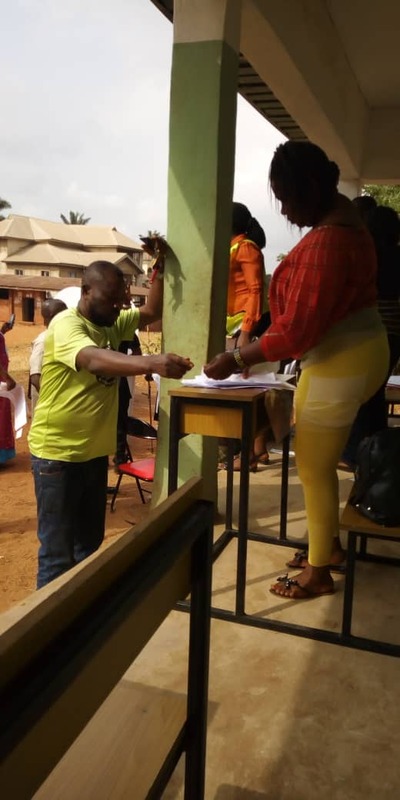 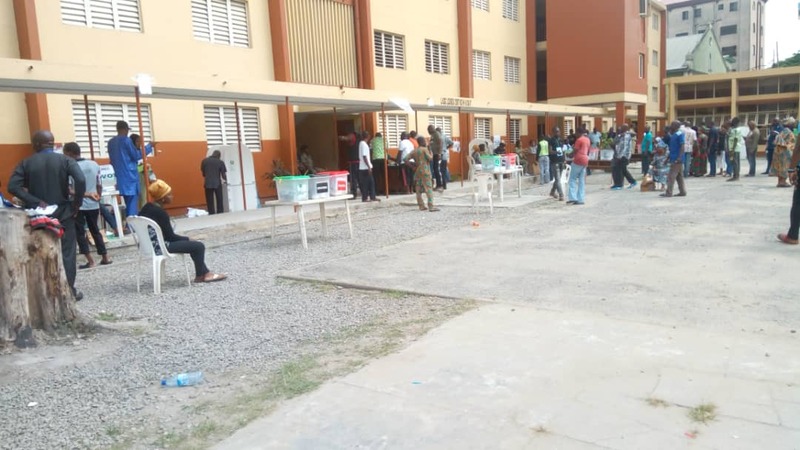 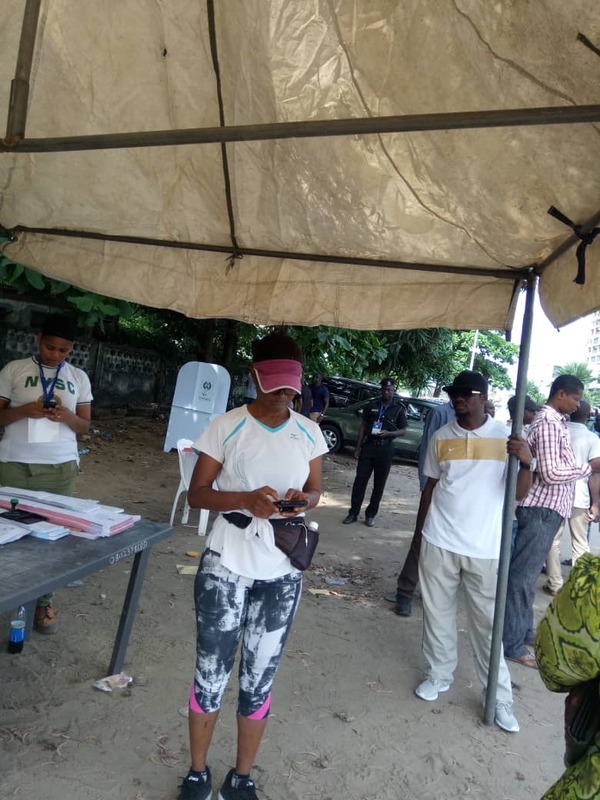 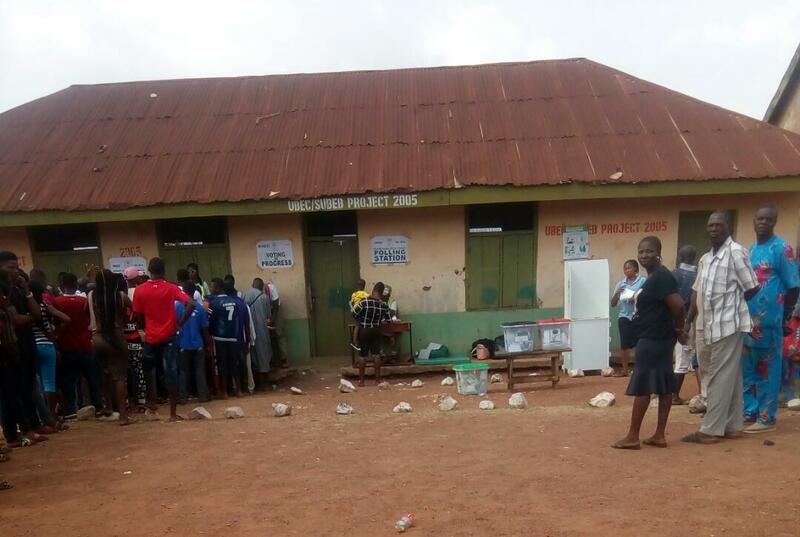 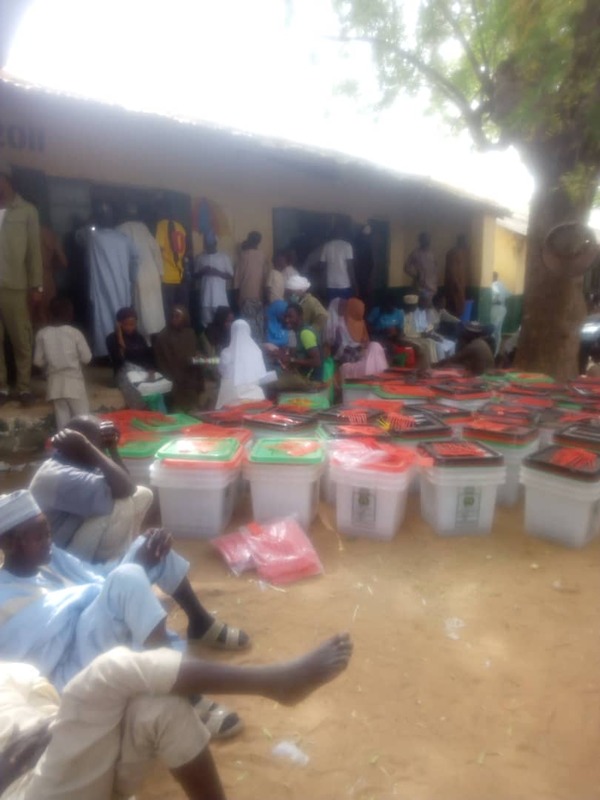 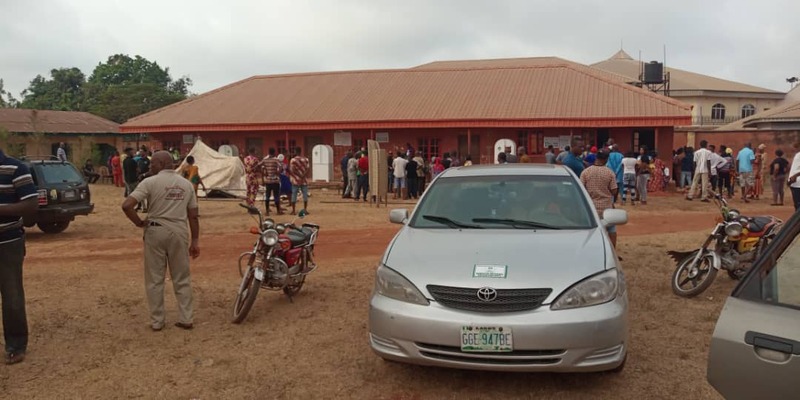 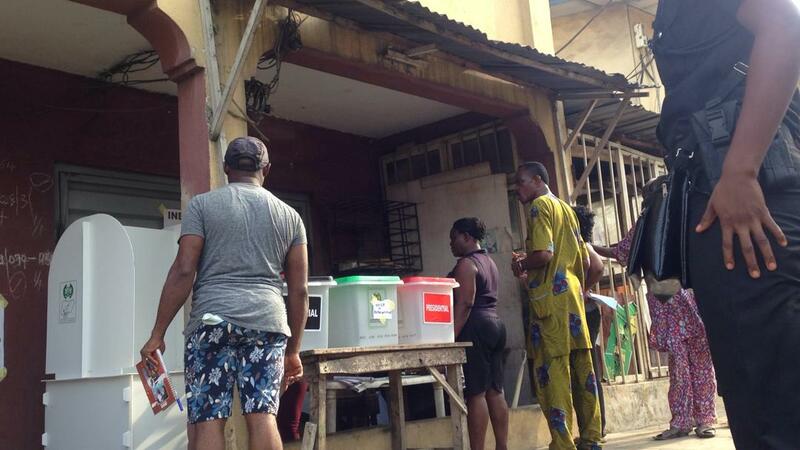 A frustrated electorate at Sabon Tasha Secondary School alleged that the delay was deliberate. 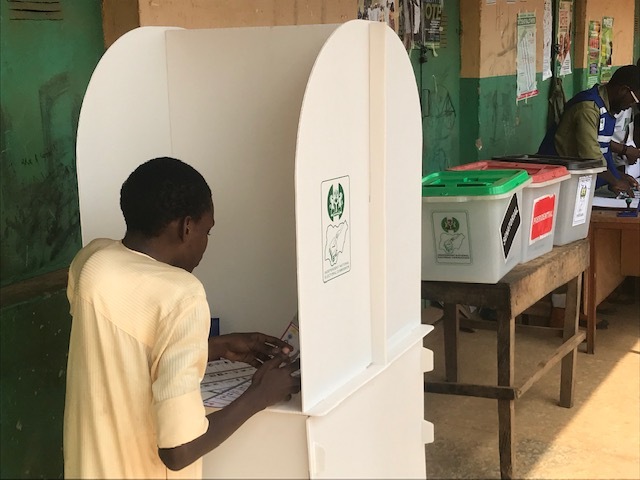 He insinuated that election would have started in the north axis of the state and the delay in the south was to systematically disenfranchise them. 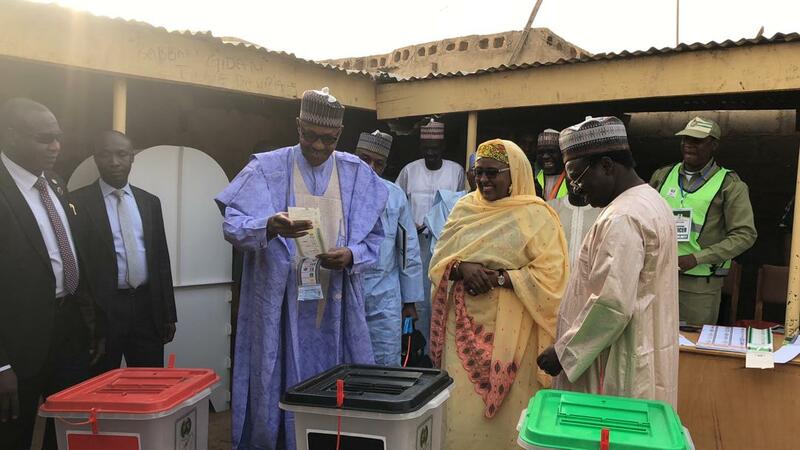 “Go to their own side now, you’ll see that they’ve started voting already. 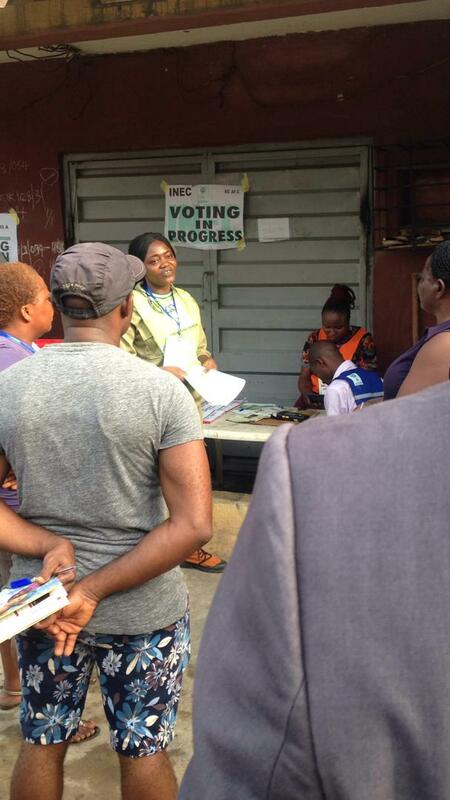 They are just delaying this process, they don’t want us to vote,” he said purging his frustration to this reporter. 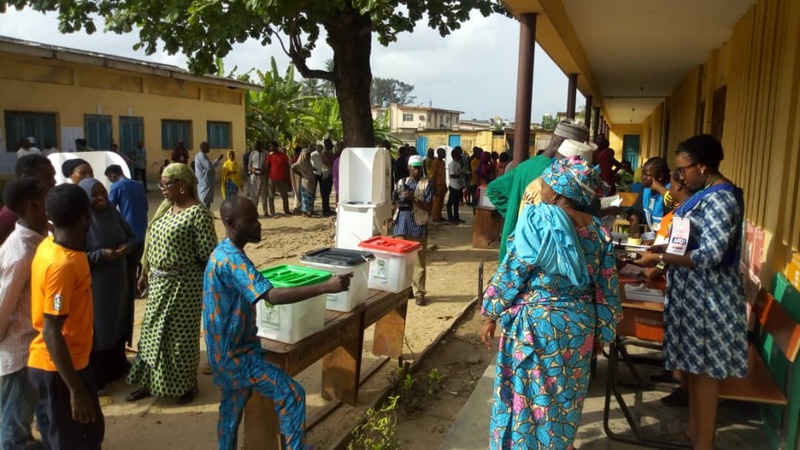 @8:48am, Ward 02 PU 012, Shomolu Lga Lagos East. 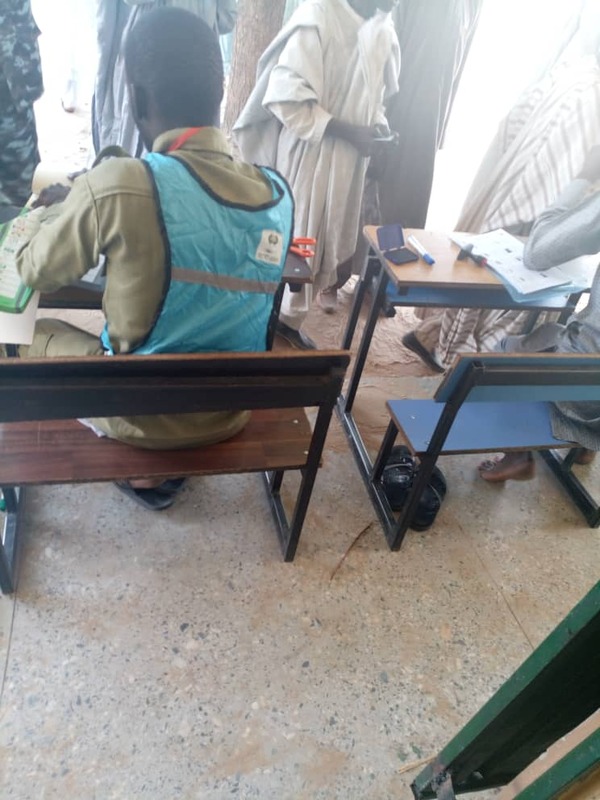 Accreditation going on and ballot boxes yet to be sealed. 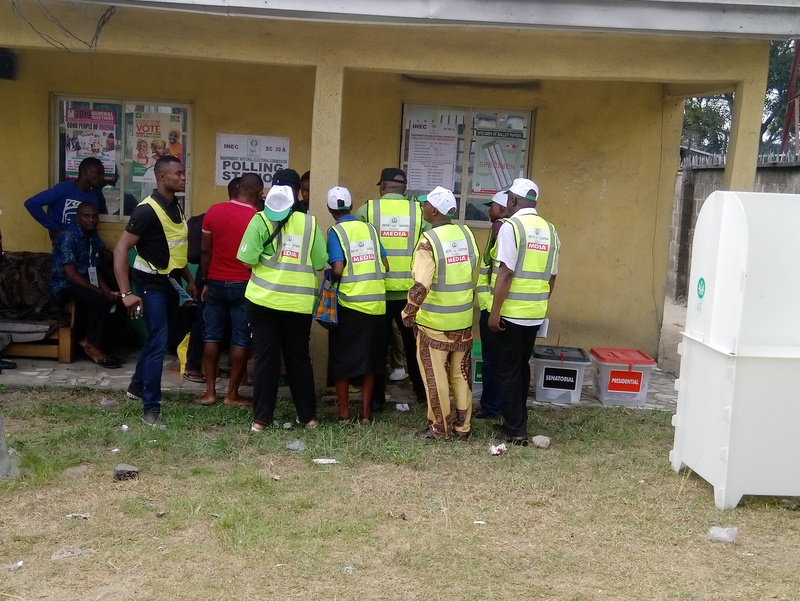 @8:43am, Ward 02 PU 012, Shomolu Lga Lagos East. 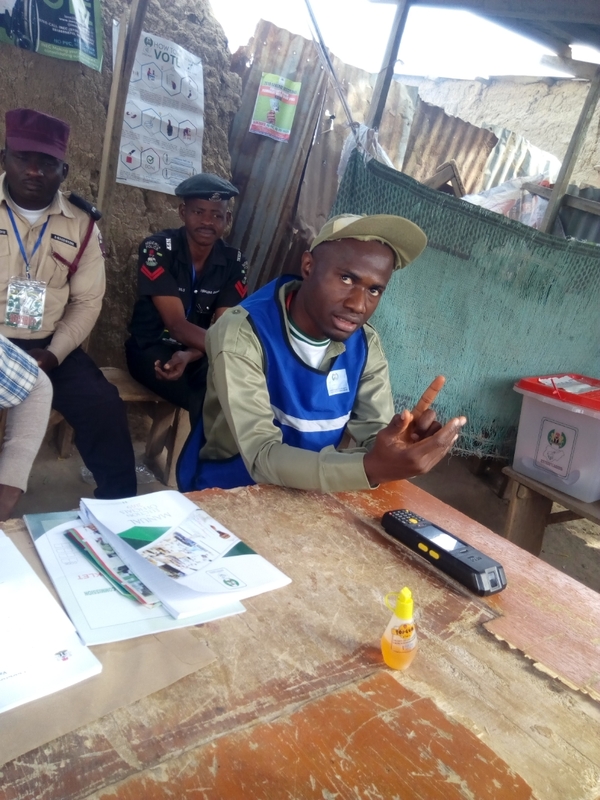 PO addressing Voters on the election procedures as voting is yet to commence. 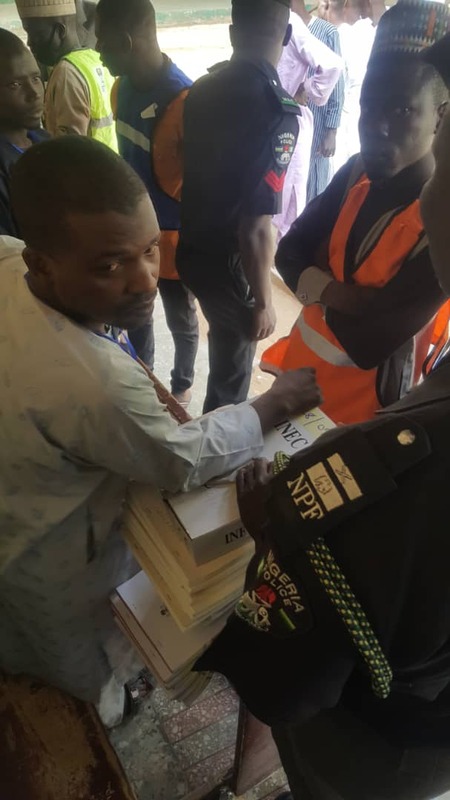 Situation Report Materials just arrived and i asked the Adhoc staff why when the election is suppose to start my 8am. 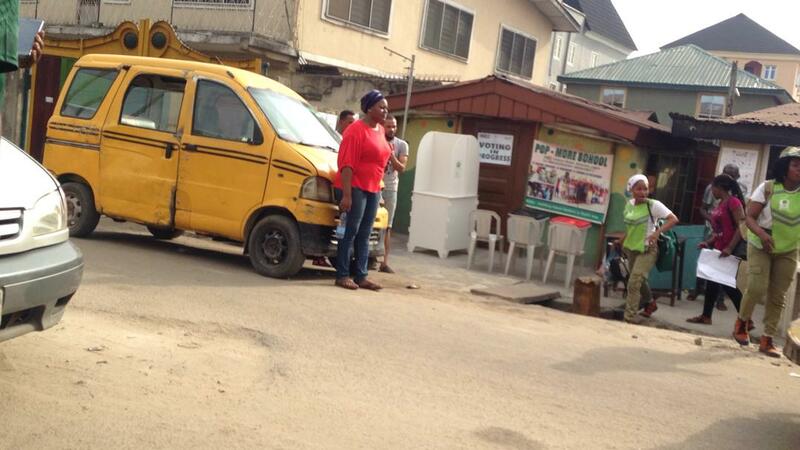 I was told lack of mobility. 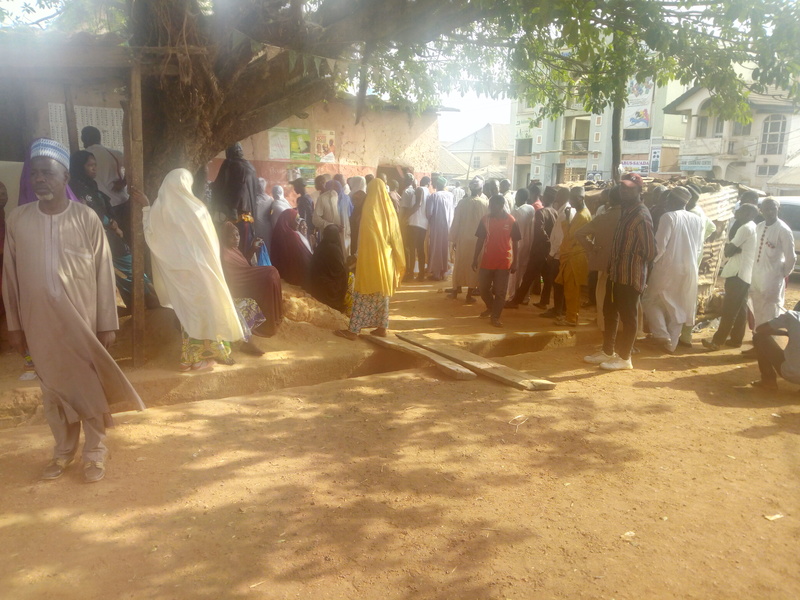 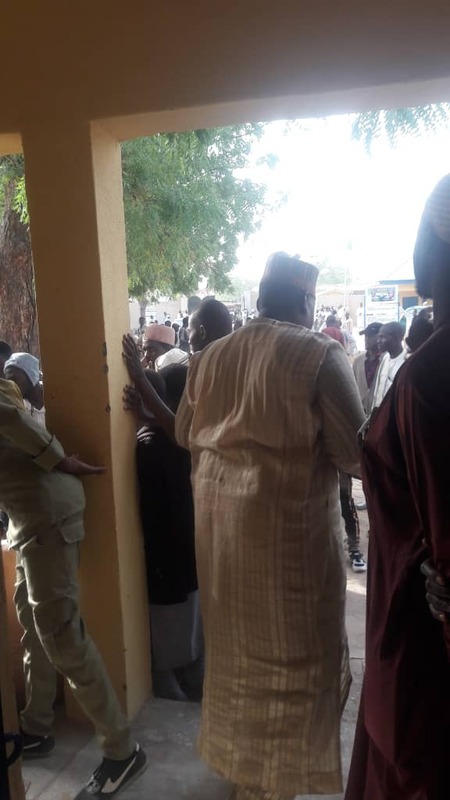 @ 7:41am: Area court polling unit, Beji Niger east senatorial district where a lawmaker Muhammed Bosso Paiko is to cast his vote.